The Glenwood track meet that was scheduled for today has been reschedule for next Friday, April 26th at WPHS. The schedule of events will be the same. Due to heavy rain, the track meet scheduled for today, Thursday, April 18th, has been postponed until a later date. We will let you know the updated schedule as soon as possible. Thank you! Track & Field pictures for 5th - 8th grades will be tomorrow, Thursday, April 18th! All athletes need to bring their jerseys. Glenwood Bus Route 9 will be running late this morning. Parents may drop students off, if possible. Thank you for your patience. 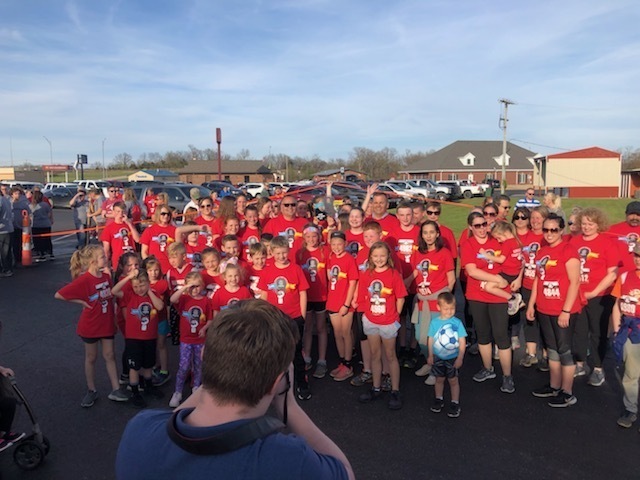 On Friday evening, April 6th, 2019 Ozarks Medical Center hosted its annual Fun Run and Walk to raise funds for the OMC Cancer Treatment Center. Organizations with the greatest number of participants were vying for the "Spirit Award"! 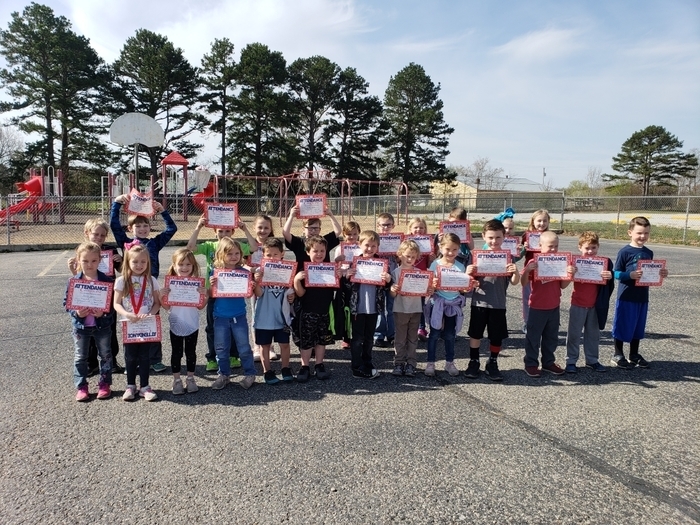 Glenwood students and faculty were the winners of the "School Spirit Award" for having the most participants! A big thank-you goes to Stacy Kutter for participating in the committee work and recruiting participants here at Glenwood!! 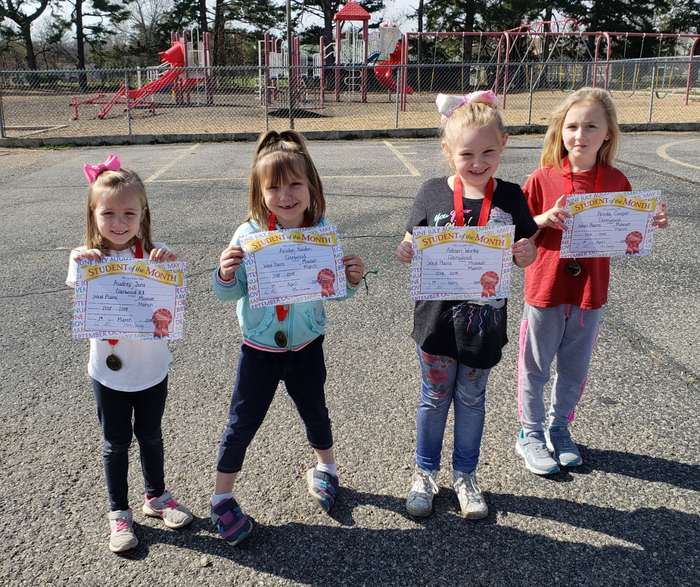 Congratulations to the Glenwood School Preschool through 2nd grade March Students of the Month: Preschool - Audrey Jens Kindergarten- Anistyn Neldon 1st grade - Adisen Worley 2nd grade - Brooke Cooper Way to go, Mustangs! 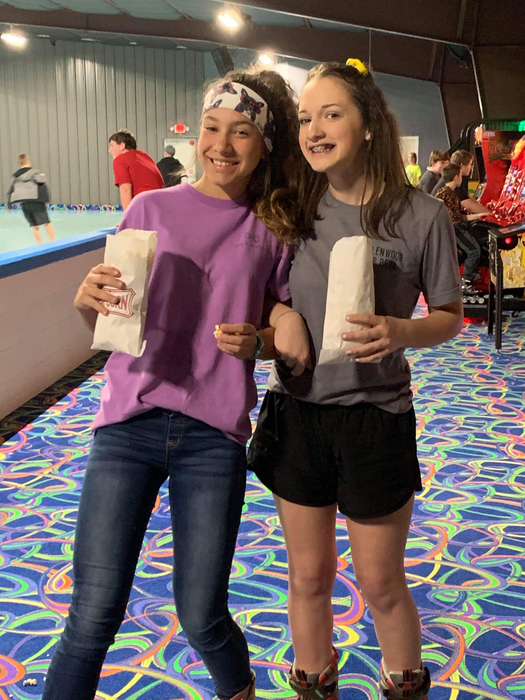 BETA night at Skateland! Thank you Mustangs for all of your support to help the BETA national qualifiers travel to OKC this summer! 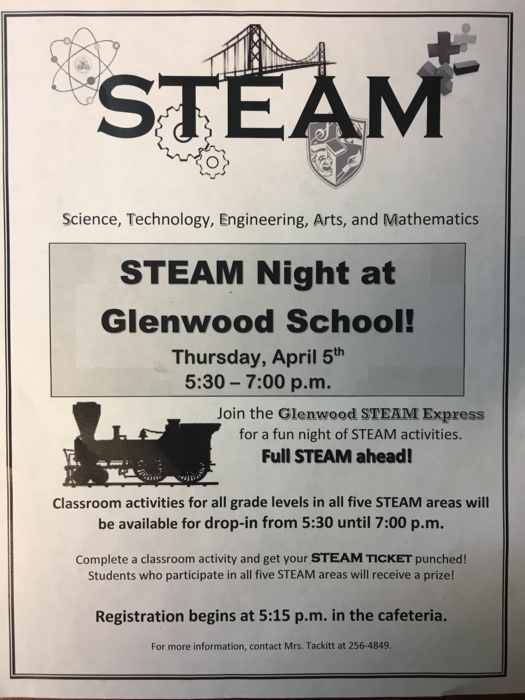 Glenwood School invites you to our annual STEAM (Science, Technology, Engineering, Arts, & Mathematics) Night! Thursday, April 4th from 5:30 p.m. - 7:00 p.m. in the Glenwood School gym. The Panther Relays will be held this Friday, March 29th at WPHS. Runners will receive their events on Wednesday. The event schedule is below. Go, Mustangs! Reminder: Next week is Spring Break! 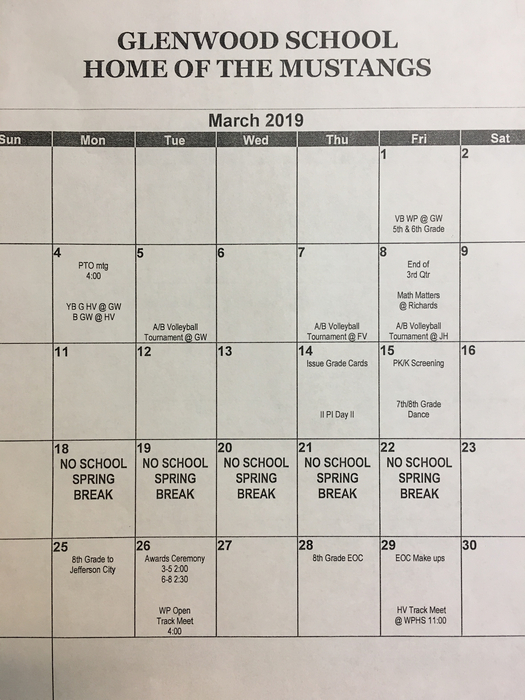 School will not be in session March 18th - 22nd. We will see everyone back on Monday, March 25th! 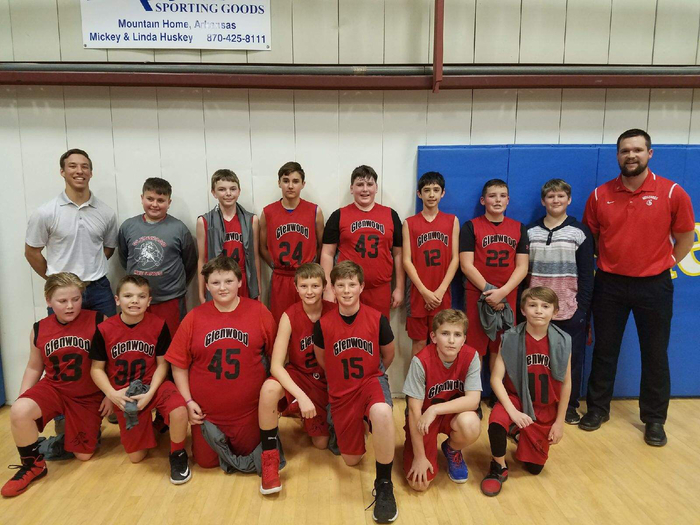 Glenwood Sports Pictures Reminder: Sports pictures for the Youth Basketball and Volleyball teams will be taken on Wednesday, March 13th at 2:00 p.m. All athletes need to bring their uniforms and picture envelopes. Glenwood Lady Mustangs B team wins 3rd place in the HCAA volleyball tournament!! Thank you to the athletes, parents and coaches for a great season! Way to go, Mustangs! 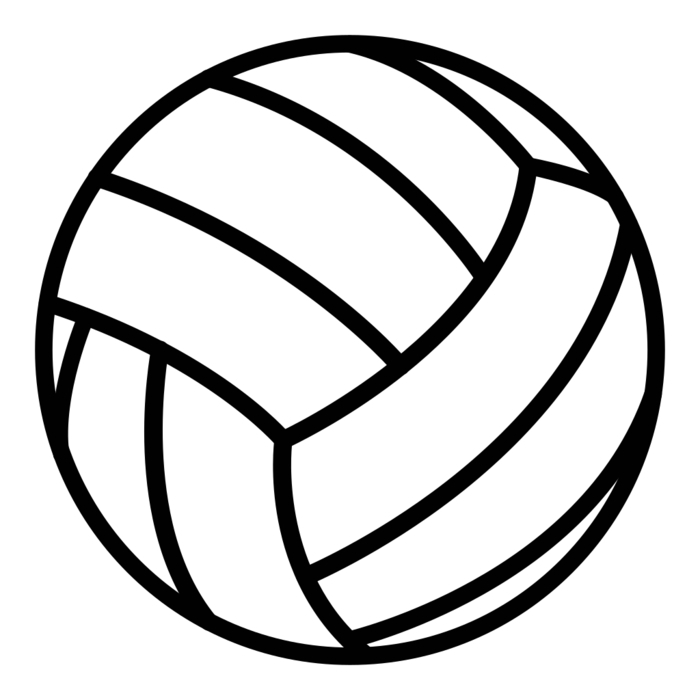 The Lady Mustangs B Team will play for 3rd place in the HCAA volleyball tournament at Junction Hill on Friday, March 8th at 4:30 p.m. Come out and support the Lady Mustangs and Coach Kutter! Go, MUSTANGS!!! Glenwood School Booster Club Please have all orders and money turned in to Coach Kutter by March 12th. Congratulations to this group of students and staff who ran this morning in the Heart of the Ozarks race. Both teams braved the cold and ran a great race. Mrs. Bradshaw also ran in the individual 2 mile. Way to go, Mustangs! 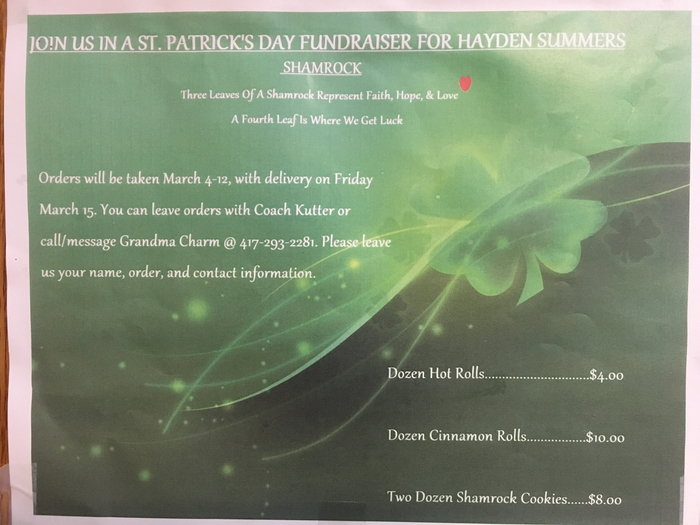 Glenwood Athletic Department's Booster Club would like to extend a hearty "Thank You" to everyone who has recently helped to raise money to assist in the treatment for our Glenwood student-athlete, Hayden Summers! Karen Owens was the winner of the gift package that was graciously donated ty Southern Sass Salon of West Plains. For those who purchased Tee Shirts, we appreciate it and want to let you know that they will be ready for pick-up the week of February 25th. There is still time for baseball fans who'd like to help in this cause to buy raffle tickets for the Cardinals/Cubs game tickets drawing which will be held on Friday, March 1st! Additionally, February 22nd will be the final Friday Fun Day for students! All money may be turned in to Coach Stacy Kutter! Don't forget to order your Valentine's Day carnations! Carnation order forms and money are due tomorrow, Wednesday, February 13th. Flowers will be delivered to students on Thursday. 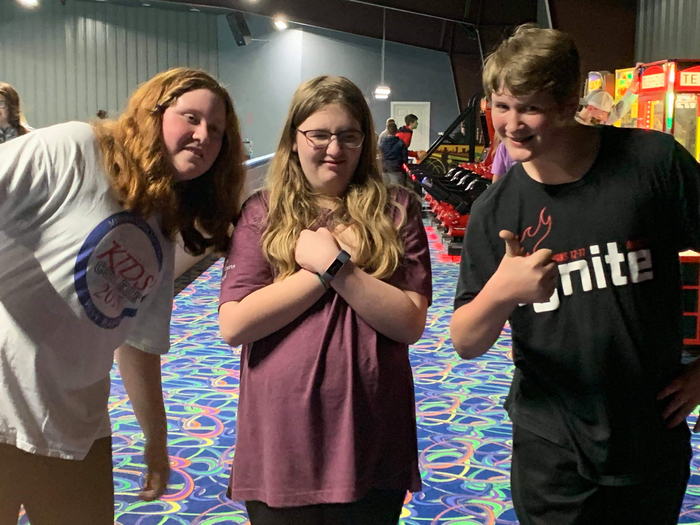 Thank you for supporting the Glenwood School Eighth Grade of 2019! 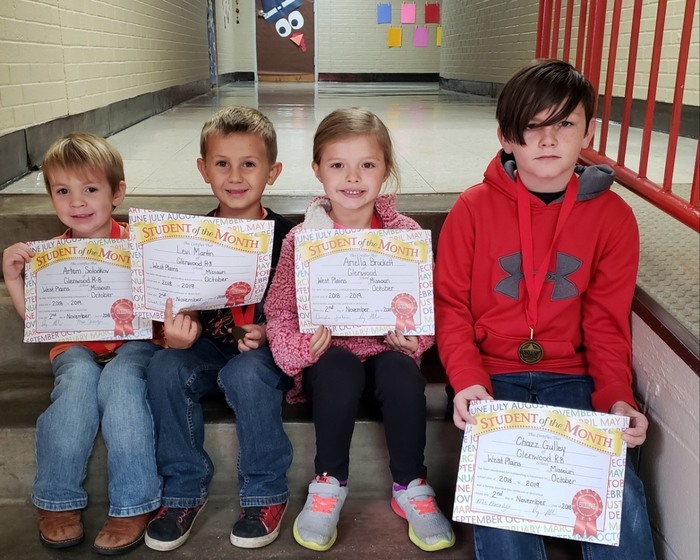 Congratulations to the January 2019 Students of the Month! 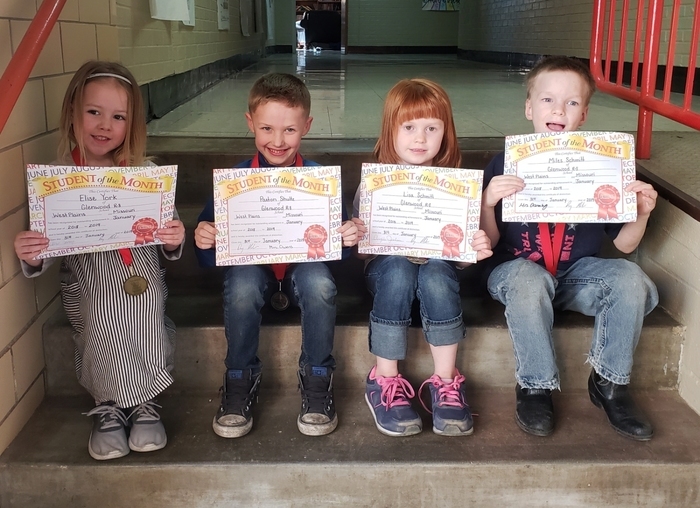 PreK- Elise York Kindergarten-Paxton Shultz 1st grade-Lisa Schmitt 2nd grade-Miles Schmitt Way to go, Mustangs! Pee Wee Basketball reminders: Tuesday, February 5th is game day! 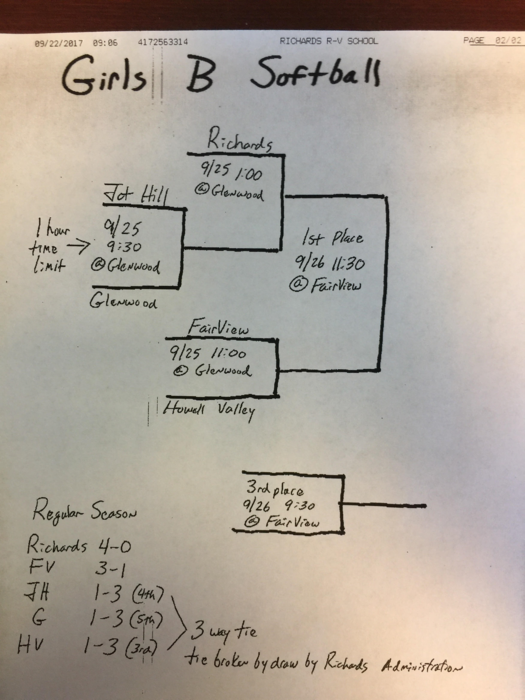 The Glenwood Boys will host the Richards Boys at Glenwood while the Glenwood Girls travel to Richards. Approximate game times: 5:30 - 4th grade 6:00 - 5th grade 6:30 - 6th grade There will not be a bus to the games, and all athletes are asked to arrive early, if possible. If you have any questions please contact one of the coaches. NO SCHOOL today, Wednesday, January 30th due to inclement weather!! 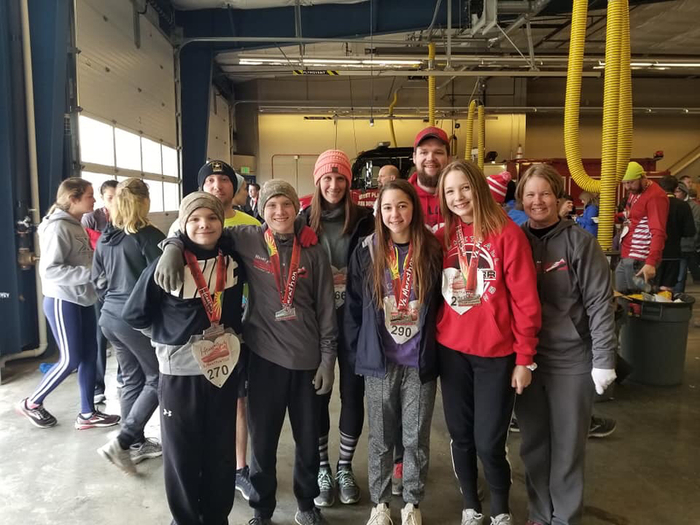 The Glenwood School Booster Club will be raising funds throughout the month of February to help out with the medical expenses of a student athlete very recently diagnosed with leukemia. Fundraiser forms are going home today with all fundraising information, including a t-shirt order form which should be returned on or before Friday, Feb. 8th. All raffle ticket and Friday-Funday money can be turned in to Coach Kutter. Thanks for working together with us for the good of our fellow Mustangs! 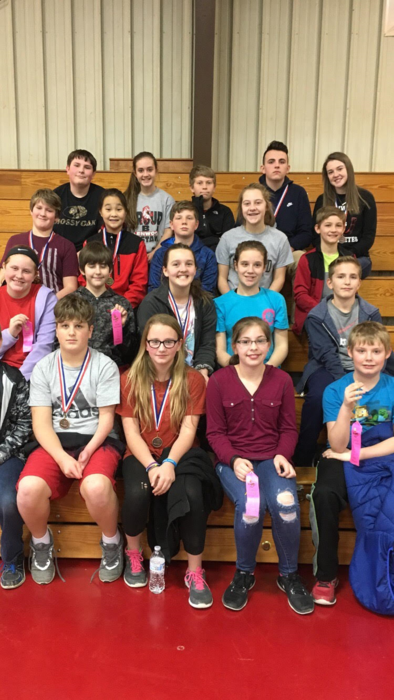 The Glenwood School Mathletes competed last Saturday at the MSU-WP Middle School Math Relays. Congratulations to the students and sponsors who attended the contest! 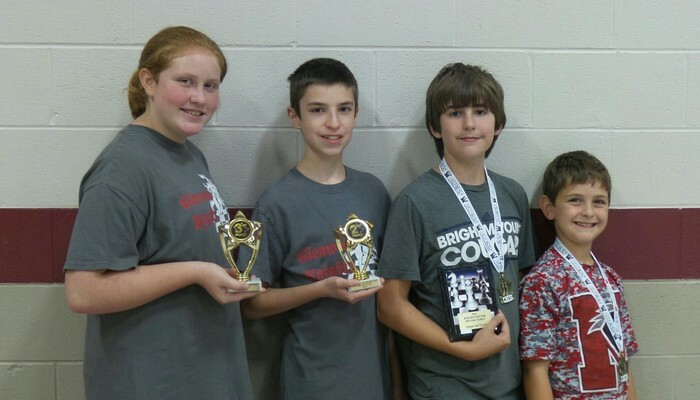 5th Grade: Jessica Doiron, Jacob Bassham -4th in Problem Solving, Lillian Blagg – 1st in Fractions and 3rd in Graphs/Geom, Jaycee Clinton – 3rd in Fractions, Bella Berry – 2nd in Graphs/Geom, and Caden Sciotto – 5th in Graphs/Geom 7th Grade: Toby Keith, Lauren Shipley, and Aaron Vaughan 8th Grade: Anna Ingalls, Kody Apel, Gavin Williams, Logan Tarlton, and Elizabeth Owens – 1st in Arithmetic/Fractions, 4th in Geometry, and 5th in Algebra Sponsors: Rebecca Harrison, Middle School Math teacher and Aly Johnson, 5th Grade Math teacher Way to go, Mustangs! Reminder: Friday, Jan. 18th is a teacher in-service day and Monday, Jan. 21st is Martin Luther King, Jr. holiday. School will resume on Tuesday, Jan. 22nd. Chess Tournament Update Due to possible winter weather this weekend, the Willow Open chess tournament scheduled for this Saturday, January 19, has been postponed until further notice. The next chess tournament is scheduled for Saturday, February 2nd, at Galena High School. 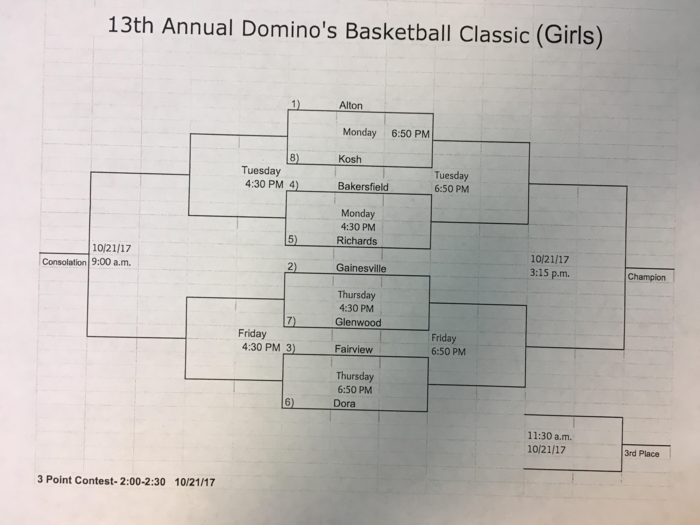 A Team Basketball Tournament Week Girls will play tonight at Junction Hill at approximately 5:30 p.m. 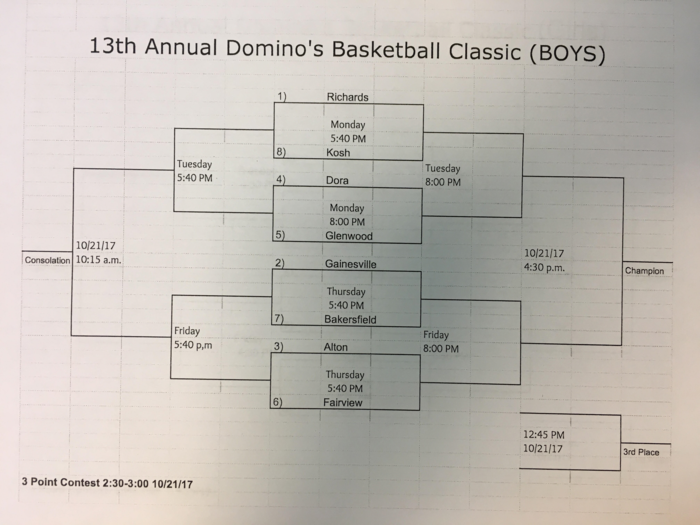 Boys will play tomorrow at Richards at approximately 6:45 p.m. Both teams will play Thursday at Howell Valley, times tbd. Glenwood School will be closed today, Friday, January 11th, due to inclement weather. Please stay safe! 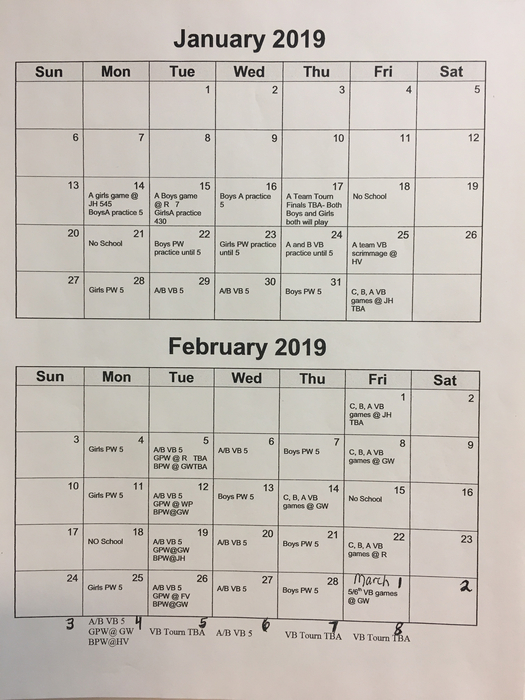 Sports calendar for January and February, 2019. The Willow Open Chess Tournament scheduled for this Saturday, January 12th will be moved to Saturday, January 19th, due to expected inclement weather. 2nd Quarter grade reports were sent home today. If you have questions concerning the report please don't hesitate to contact your child's teacher. Thank you! 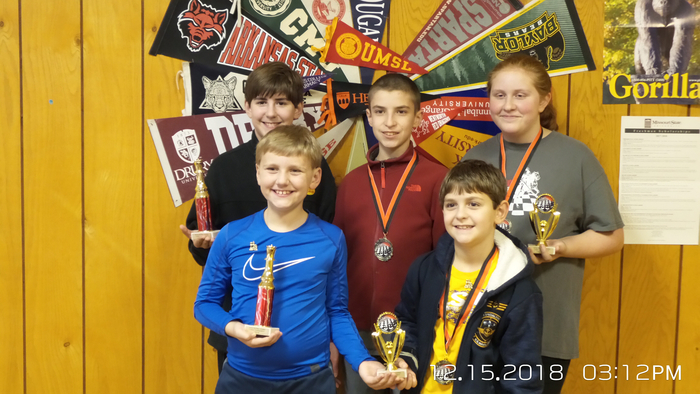 Central Ozarks Chess Tournament Seven members of the Glenwood Knights were able to participate in the Central Ozarks Chess Tournament at the West Plains High School on Saturday, December 15. Each member performed very well bringing home two second place team trophies; one for the Junior High team and one for the Elementary team. 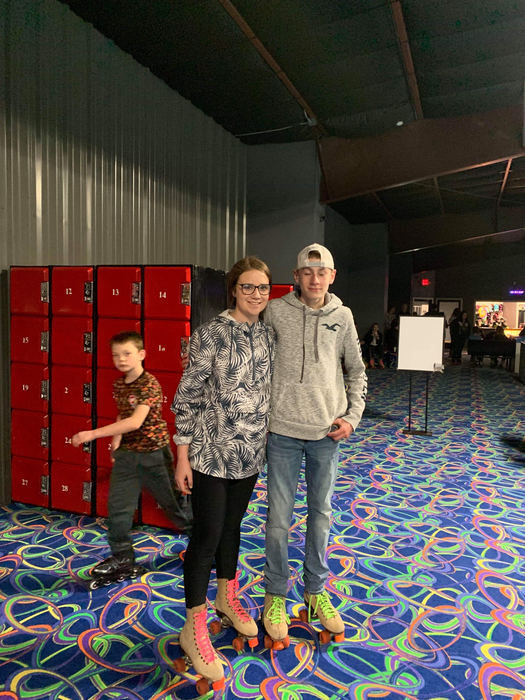 Team players and individual placements are as follows: Junior High Division: Kayden Curran – 15th place (not pictured), Kyler Curran-12th place (not pictured), Toby Keith – 3rd place, Morgan Lee – 6th place and Lauren Shipley – 10th place. Elementary Division: Colton Forrester – 3rd place and Tucker Keith - 4th place. Way to go Knights!! Happy Holidays! Glenwood School will dismiss for holiday break at 12:15 p.m. tomorrow, Friday, December 21st. Buses will run at approximately 12:30 p.m. Classes will resume on Monday, Jan. 7th. We hope everyone has a wonderful and safe holiday season! Glenwood School welcomed representatives from area high schools today to speak to the 8th grade class. 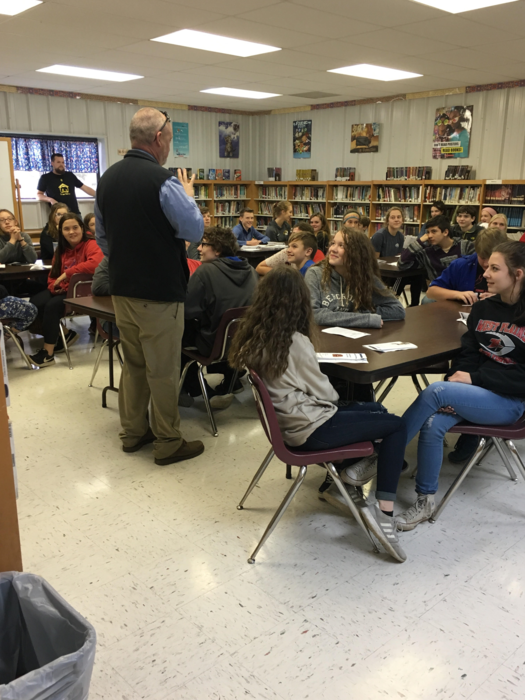 Willow Springs, Koshkonong, Dora and Bakersfield schools presented information about their high school facilities and programs as well as answered any questions the students had about transitioning to high school. 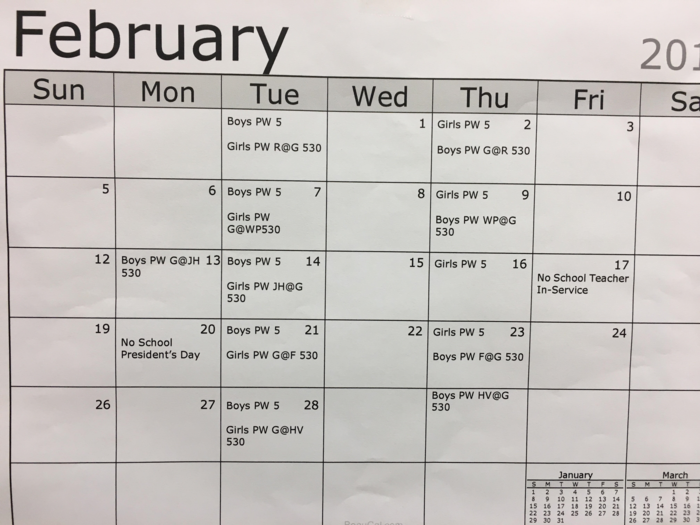 Glenwood School Athletics Event Schedule B Team Basketball Tournament Monday, Jan. 7th @ GW Tuesday, Jan. 8th @ HV Thursday, Jan. 10th @ FV A Team Basketball Tournament Monday, Jan. 14 @ JH Tuesday, Jan. 15th at R Thursday, Jan. 17th at HV Volleyball Jan. 25th – A Team Scrimmage @ HV Feb. 1st – GW@JH Feb. 8th – FV@GW Feb. 14th – HV@GW Feb. 22nd – GW@RR Mar. 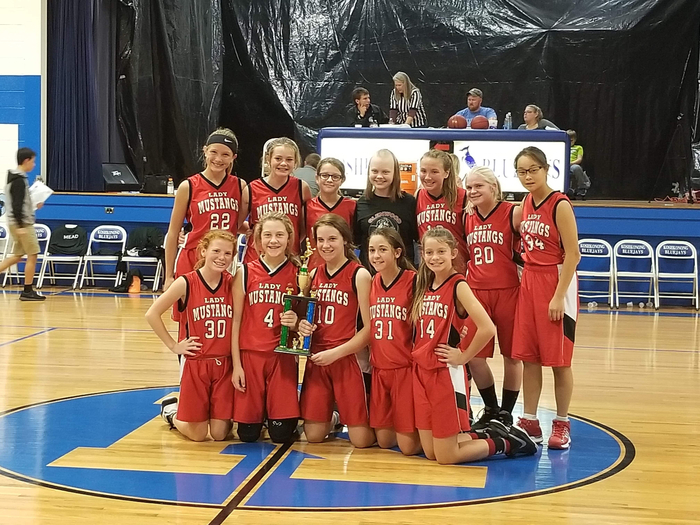 1st – WP@GW A&B Team Tournament - Mar. 5th @GW, Mar. 7th @FV, Mar. 8th @JH All games will begin at 4:30 p.m.
BE A READING SUPERHERO!!!! Glenwood School's Family Literacy Night will be held tomorrow, Thursday, December 13th. Registration and activities 5:15-6:00 p.m. Classroom sessions 6:00-6:45 p.m. Book giveaways 6:45 p.m. There will be SUPERHEROES, popcorn, and fun activities for all ages! Wear your superhero costume/t-shirt and join the fun! The Glenwood Booster Club Food Drive continues through December 20th. All are encouraged to donate items that will provide families with a holiday meal, laundry detergent and canned goods, etc. If you are interested in donating a turkey or ham, or if you know any families in the district who might be in need of assistance this holiday season please contact Stacy Kutter. The Title I mid-year review meeting will be held today at 4:00 p.m. in the Glenwood library. 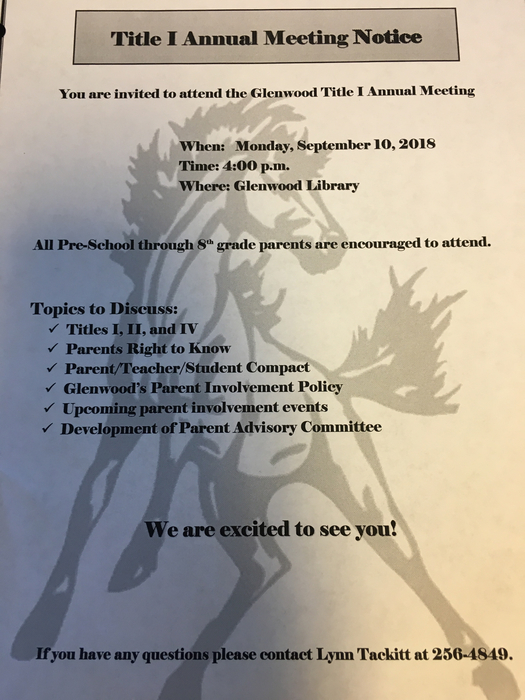 All Glenwood families are invited to attend. Glenwood 8th Grade Reminders: -All RADA orders with payment are due Tues, Dec. 4th. -Please submit your correctly spelled diploma name to Coach Kutter as soon as possible. Thank you! Glenwood students who took the MAP test last spring will be bringing home a copy of their individual results today! The 2018 MAP test was totally new to the state of Missouri and will not translate well for year over year comparison. State-wide scores are not yet available. Annual Performance Report (APR) scores will likely not be made available by the state until February 2019. We are cautiously optimistic that our overall scores are improved over the past few years! If you have questions about your student's scores, feel free to contact us! The Glenwood Mustangs will be playing tomorrow, Nov. 27th, at Fairview School. There will be a pep assembly and Pie in the Face drawing beginning at 2:45 p.m. All players and cheerleaders, including Minis, need to have their uniforms. Approximate game times are as follows: B Team Girls at 5:30 p.m. B Team Boys at 6:15 p.m. A Team Girls at 7:00 p.m. A Team Boys at 7:45 p.m. There will be a bus for A and B team players and cheerleaders leaving after school. All athletes need to be picked up at FV. Go, Mustangs! Basketball update: The Glenwood Mustangs will be playing at Fairview on Tuesday, Nov. 27th. The order of games and approximate start times will be posted soon. Watch our Facebook page and school app for updates! Reminder: There is NO SCHOOL tomorrow, Friday, Nov. 16th through Friday, Nov. 23rd. Enjoy your fall break and we will see everyone back on Monday, Nov. 26th. Happy Thanksgiving! NO SCHOOL tomorrow, Thursday, Nov. 15th due to inclement weather. The Glenwood Mustangs will be playing at Fairview tomorrow, Thursday, Nov. 15th. The order of games and approximate start times are as follows: 5:30 B Team Girls 6:15 B Team Boys 7:00 A Team Girls 7:45 A Team Boys The bus for players and cheerleaders will be leaving Glenwood by 4:00 p.m. Good luck, Mustangs! Pep Assembly Thursday, Nov. 15th The Glenwood Mustangs will have a pep assembly in the gym on Thursday, Nov. 15th at 2:45 p.m. Boys and girls basketball teams will be introduced and the Mini-Mustangs and A/B Team cheerleaders will perform. The "Pie in the Face" drawing will be held at the end of the assembly. All Mustangs fans are welcome to attend! Go, Mustangs! Glenwood School Bus 8 is will be running very late this morning. If you are on route 8 and can drop your children off at school please do so. Thank you for your understanding. Due to the expected winter weather, school will dismiss early today, Monday, Nov. 12th. Parent Pickup will begin at 2:30 p.m. Buses will run at approximately 2:45 p.m. Thank you and travel safely! Glenwood School Due to the incoming weather, school will dismiss early today. Parent pickup will begin at 2:30 p.m. with buses dismissing approx. 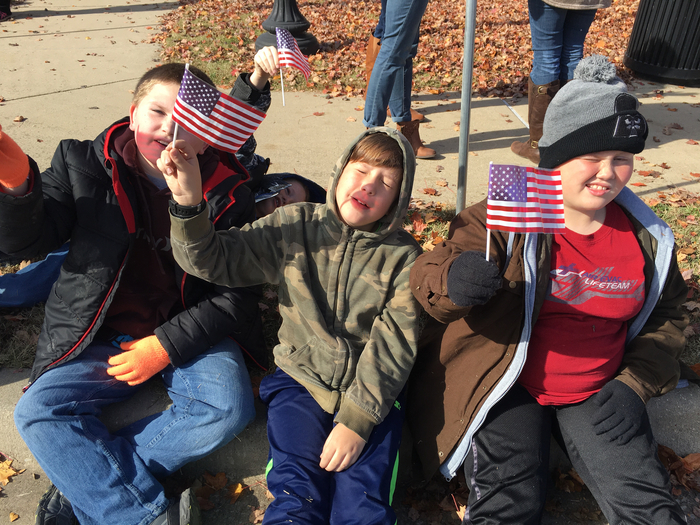 2:45 p.m.
Due to Monday's weather forecast, only students in grades 6th-8th will be attending the Veteran's Parade. It is expected to be extremely cold and all middle school students should dress warmly. Reminder: The Glenwood School Veteran's Assembly will be held Monday, Nov. 12th in the gym at 2:30 p.m. All visitors are welcome to attend. The Veteran's Day Parade will be Monday, Nov. 12th. The parade begins at 11:00 a.m. and all Glenwood students will be attending. 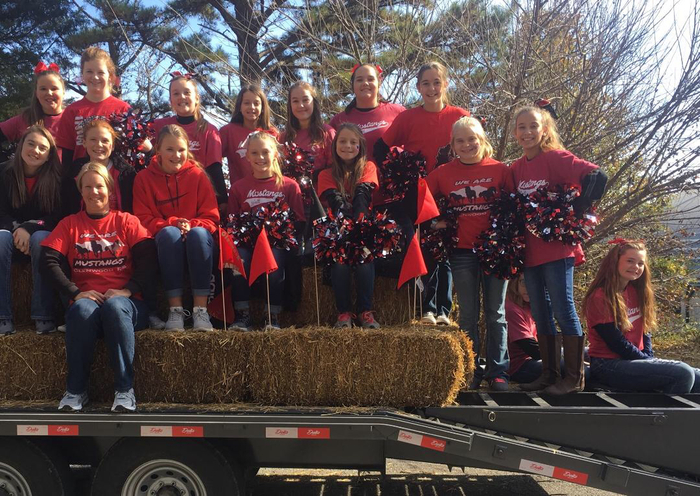 Cheerleaders and members of the Glenwood Band will be in the parade. Please dress warmly! The Glenwood Veteran's Day Assembly will be held Monday, Nov. 12th at 2:30 p.m. in the gym. All Veterans are invited to be our honored guests. Friday, Nov. 9th will be our first home basketball game for the 2018-2019 season. Make plans to join us and support our Glenwood Mustangs! 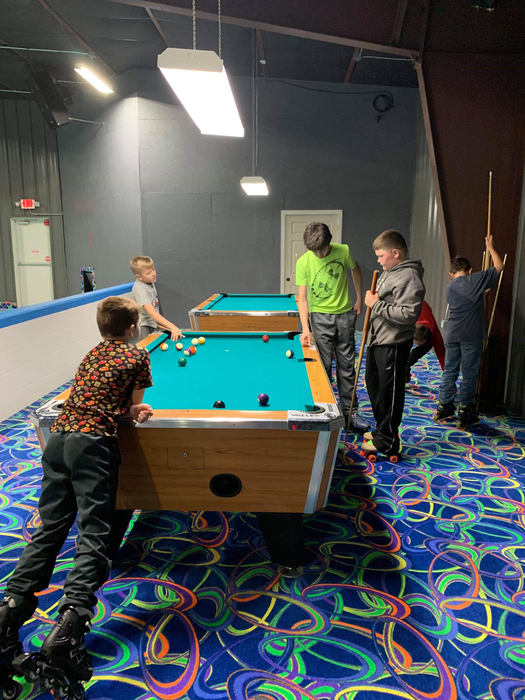 Approximate game times: 3:00 B-Team Girls 4:00 A-Team Girls National Anthem Booster Club drawing 5:00 B-Team Boys 6:00 Mini Mustangs performance (arrive by 5:45 in the cafeteria) 6:15 A-Team Boys Reminder: The Booster Club drawing for Dairy Queen and Skateland passes will be held after the A-Team Girls’ game this Friday night. Tickets are $1 each or $5 for 6 and can be purchased from any coach or at the game. Proceeds will be given to the Vaughan family for medical expenses. 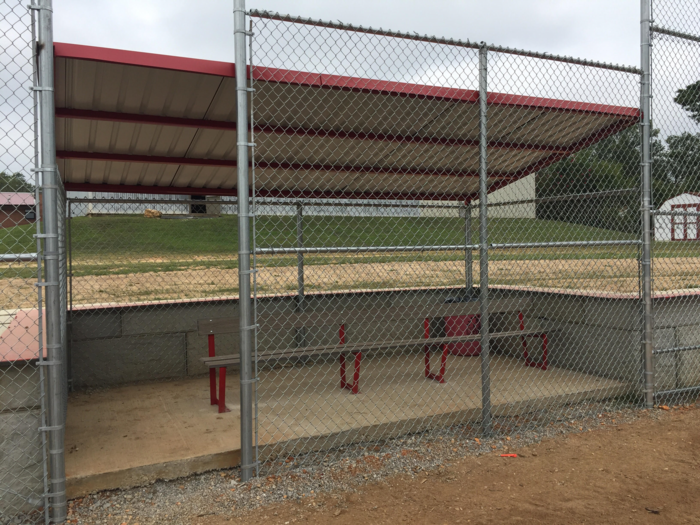 Game Time Change from Glenwood Athletics: This Friday's ballgames vs JH will now begin at 3:00 P.M. here at Glenwood. Normal game sequence schedule will be followed. Mini Mustangs arrive at 5:45 p.m. Follow Facebook for more info. The Booster Club annual "Pie in the Face" fundraiser will be held Nov. 5th-15th. $.25 tickets can be purchased and placed in a drawing for a chance to put a pie in the face of a coach or Mr. Melvin. See Coach Kutter or Coach Browning to purchase tickets. All money raised will be split between St. Jude's Children's Hospital and the Holden family. Thank you for your continuted support! All Glenwood hoodie order forms and money are due tomorrow, Monday, Nov. 5th!!! See Stephanie in the front office of you need a form. Thank you for supporting the Glenwood PTO. 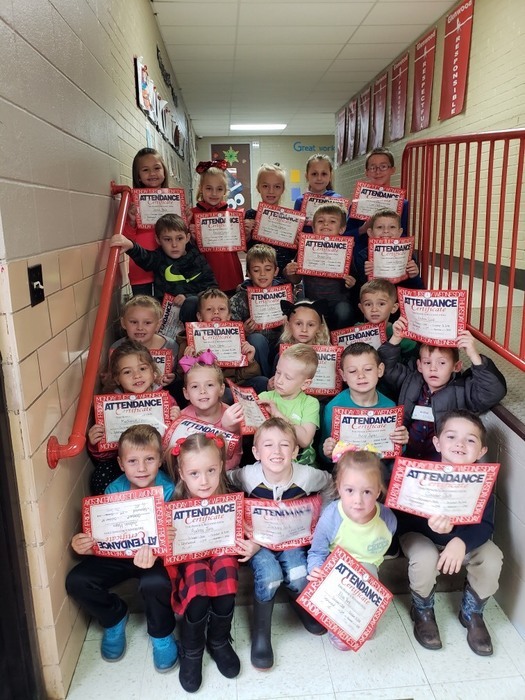 October Perfect Attendance Pre-K through 2nd Grade Bottom Row: Jud Hayes, Audrey Jens, Zach Smith, Elise York, Cooper Jett 2nd Row: Mackenzie Melvin, Ellie Smith, Lane Tackitt, Avery Joyner, Andrei Luck 3rd Row: Adisen Worley, Noah Lamb, Annie Freidt, Max Freidt 4th Row: Briar Crase, Zyler Collins, Bryson Due, Cade Wilkening Top Row: Jennie Stock, Becca Loges, Lexi Clarkson, Arianna Vega, Levi Holloway Way to go, Mustangs! Reminder: Tomorrow, Oct. 31st, is a teacher in-service day and there will be NO SCHOOL! 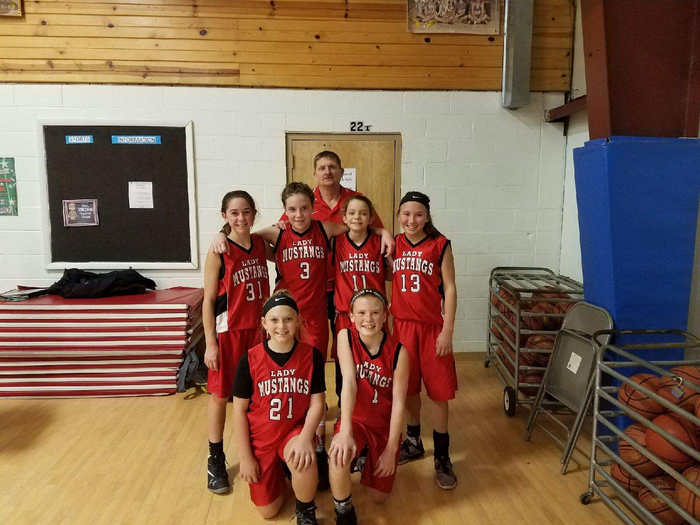 Congratulations to the Glenwood Lady Mustangs basketball team for winning 3rd place in the Koshkonong Tournament! Great job, Coach Browning and Mustangs! 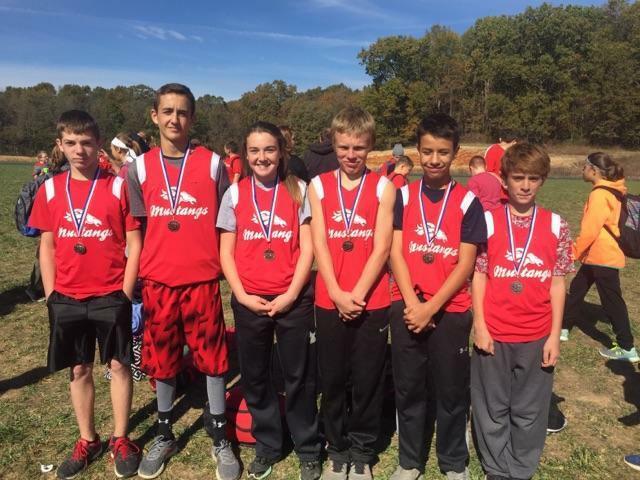 The Glenwood Mustangs Cross Country teams competed in the HCAA Conference meet held today at Junction Hill School. Congratulations to the Girls team for winning the Sportsmanship Award! 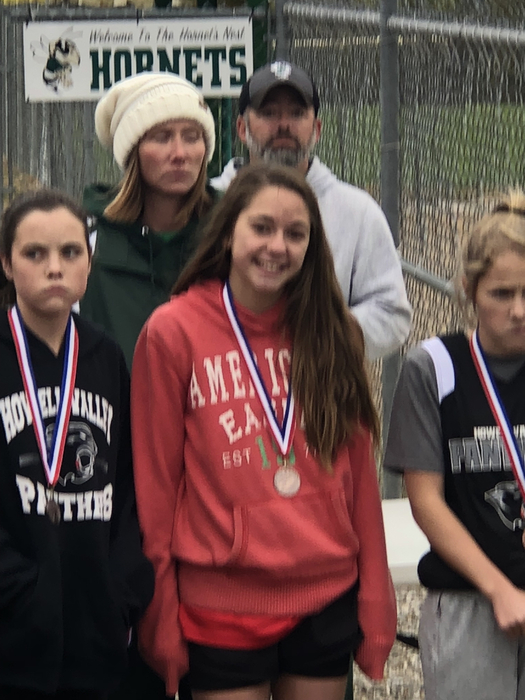 Also, congratulations to Jessie Keith for earning HCAA All-Conference! Way to go, Mustangs! HCAA Conference Cross Country Meet Hosted by Junction Hill School Friday, October 26th 11:00 Junior Girls 1 mile 11:20 Junior Boys 1 mile 11:40 Intermediate Girls 1.5 miles 12:00 Intermediate Boys 1.5 miles 12:20 Senior Girls 2 miles 12:45 Senior Boys 2 miles 1:10 Road Race Girls 1 mile 1:30 Road Race Boys 1 mile 2:00 Awards Presentation Good luck, Mustangs! 1st quarter grade reports for 6th-8th grade students were sent home today. Reminder: There will be no school Friday, October 19th. Enjoy your long weekend and we will see you back on Monday! 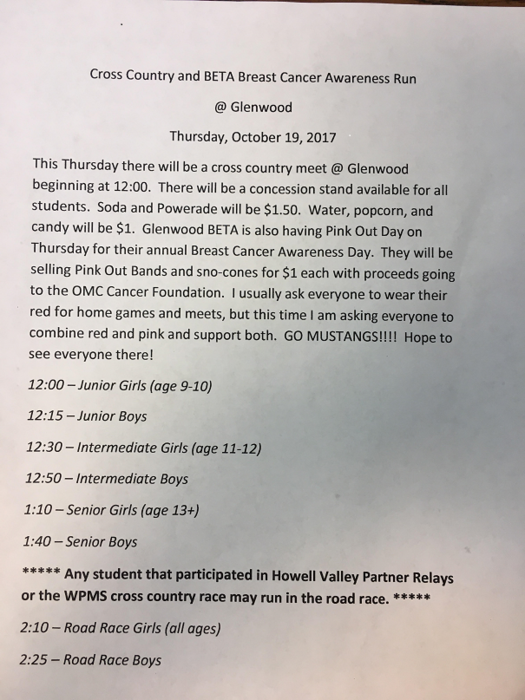 Glenwood Cross Country Meet @ Glenwood School Thursday, Oct. 18th PINK OUT DAY!! Wear pink to support breast cancer awareness. Starting times: 12:00 Junior Girls - 1 mile 12:15 Junior Boys - 1 mile 12:30 Intermediate Girls - 1.5 miles 12:50 Intermediate Boys - 1.5 miles 1:10 Senior Girls - 2 miles 1:40 Senior Boys - 2 miles 2:10 Girls Road Race - 1 mile 2:25 Boys Road Race - 1 mile Concessions will be available. GO, MUSTANGS! 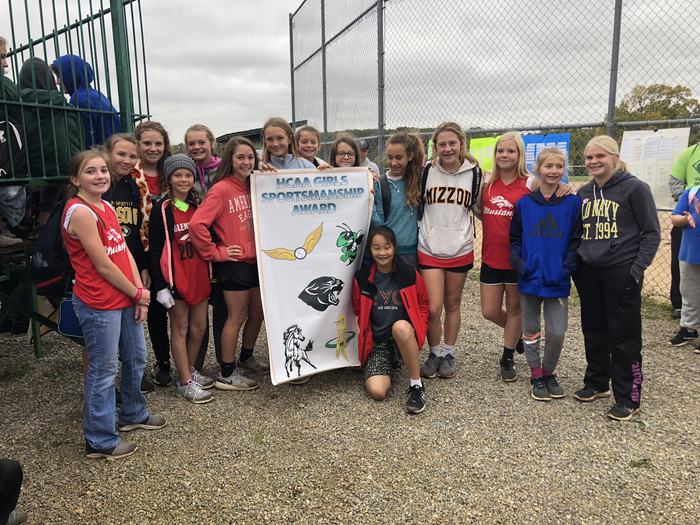 In keeping with Glenwood's tradition of honoring champions, today we treated our undefeated HCAA Conference Champion Girls B-Team Softball players escorted by Coaches Stacy Kutter and Kevin Browning! Way to go Lady Mustangs, we're PROUD of YOU! First quarter perfect attendance and honor roll recipients will be recognized in an awards assembly Wednesday, Oct. 17th in the gym. All parents are welcome to attend! 3rd-5th grades - 2:00 p.m. 6th-8th grades - 2:30 p.m.
A FREE COPY of the 17-18 Glenwood Mustang Yearbook was distributed to each Glenwood Family yesterday, courtesy of our Glenwood (PTO) Parent-Teacher Organization! If you'd like an additional copy, they are available in the front office for $5. Our thanks and congratulations go to Mrs. Beach who serves as yearbook sponsor as well as the yearbook staff pictured herein. Thanks, PTO and GO MUSTANGS!!! No Cross Country practice after school today, Monday, Oct. 15th. Parent/Teacher Conference reminder: Conferences for Pre-K through 5th grade are scheduled for this week. The 6th-8th grades will have a drop-in conference night on Thursday, October 18th from 4-8 p.m. All grade cards will be distributed at conferences. Message from the Art Department: Thank you for your Art to Remember orders. If you missed the deadline you can still order online at arttoremember.com using your student's code found on the order form. Orders will arrive in November. For more information contact Dawn King. Thursday, October 11th is Hat Day! Wear your favorite hat in support of Bullying Prevention Month! Cross Country pictures will be taken during after-school practice on Wednesday, Oct. 10th. All runners need to bring their jerseys and picture envelopes. 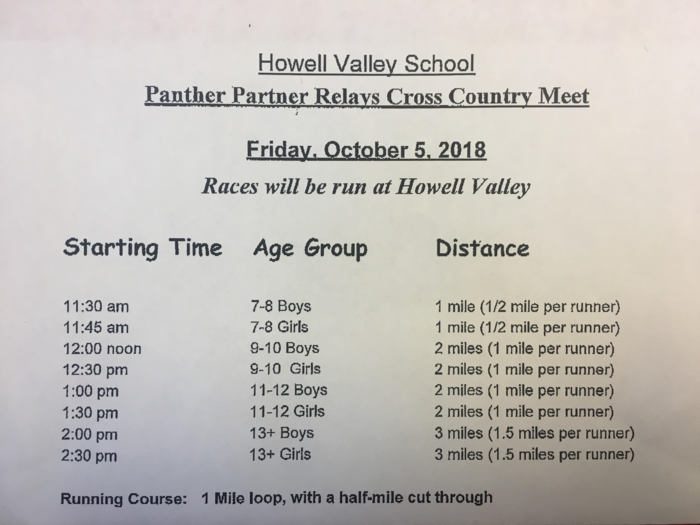 Practice ends at 4:30 p.m.
Friday, Oct. 5th, the Glenwood Mustang runners will be competing in the Panther Partner Relays Cross Country Meet at Howell Valley School. Running times and distances are shown on the schedule attached. Good luck, Mustangs! 5th through 8th boys basketball tryouts will be after school Thursday and Friday until 5. The Boys A-Team and Girls A-Team both took home second place in the tournament today! 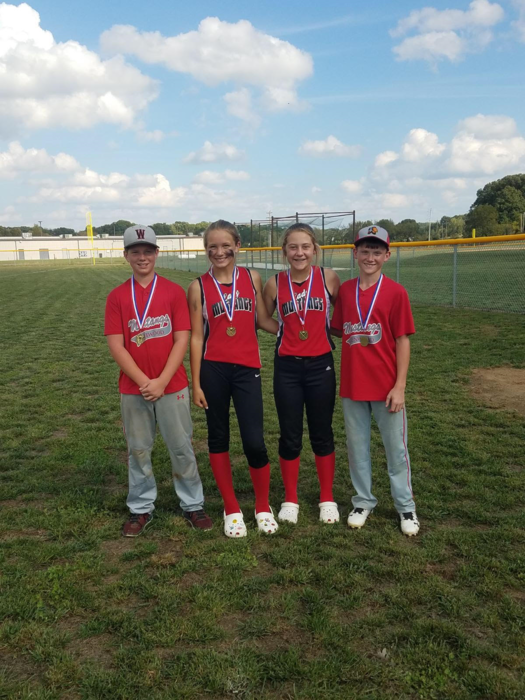 Pictured below are our Glenwood Conference All-Stars: Jaden Barrett, Allyssa Joyner, Brooklyn Mead, and Myles McGhee. Way to go, Mustangs! Art to Remember orders (with payment) are due Monday, Oct. 8th. Online ordering is available. Refer to your Art to Remember envelope for more information. Thank you for supporting the Glenwood School Art program! Reminder: Picture Re-takes will be tomorrow, Thursday, Oct. 4th, at 8:00 a.m.! Watch for the Breast Cancer Awareness T-shirt Order Form coming home today! Completed forms and money are due to Ms. Frazier by Friday, Oct. 5th. After School Cross Country Meet Today, Tuesday, Oct. 2nd!! 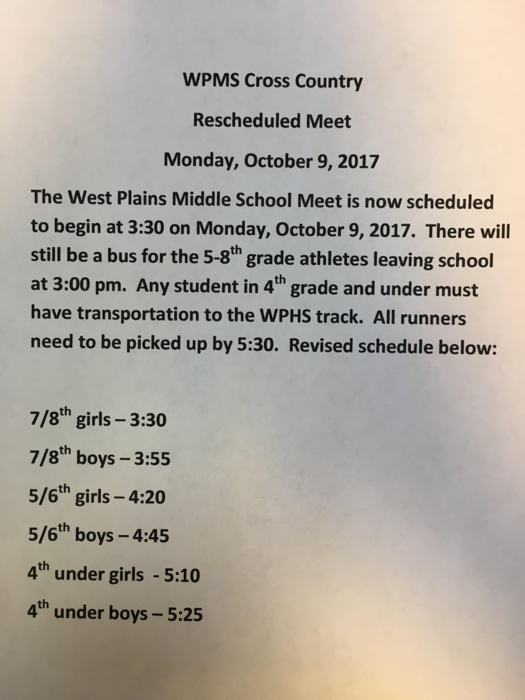 5th-8th grade runners will ride a bus to the meet at 3:15 p.m. today. Approximate race times are as follows: 7th/8th girls 4:00 7th/8th boys 4:20 5th/6th girls 4:45 5th/6th boys 5:05 All 4th grade and under runners will need to be dropped off and checked in with Coach Kutter by 5:15 p.m. All runners need to be picked up by 6:00 p.m. Admission for spectators is $1. There will be a concession stand. The B Team Lady Mustangs are tournament champions! What a great season! Congratulations! 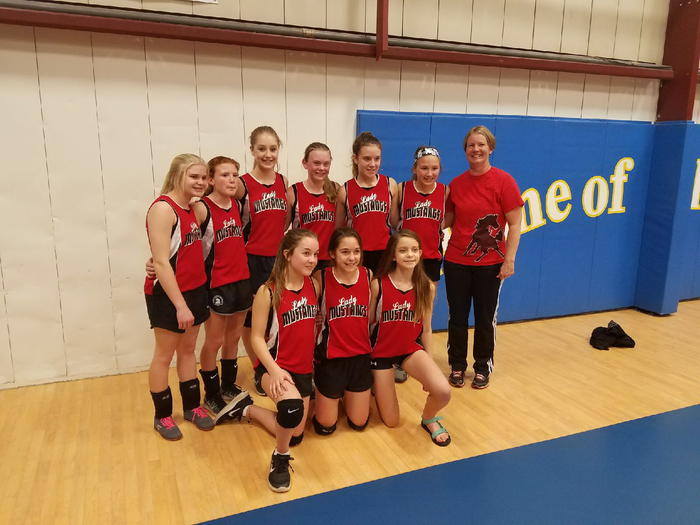 B Team Girls play for the CHAMPIONSHIP at 1:00 p.m. today at Glenwood. Come out and support our Lady Mustangs! The B Team Girls will play at 9:00 a.m. on Monday, October 1st at Glenwood. The schedule for the remainder of the day will depend on the outcome of this game. A Team Boys and A Team Girls will both play on Wednesday, Oct. 3rd at Richards. Go, Mustangs! 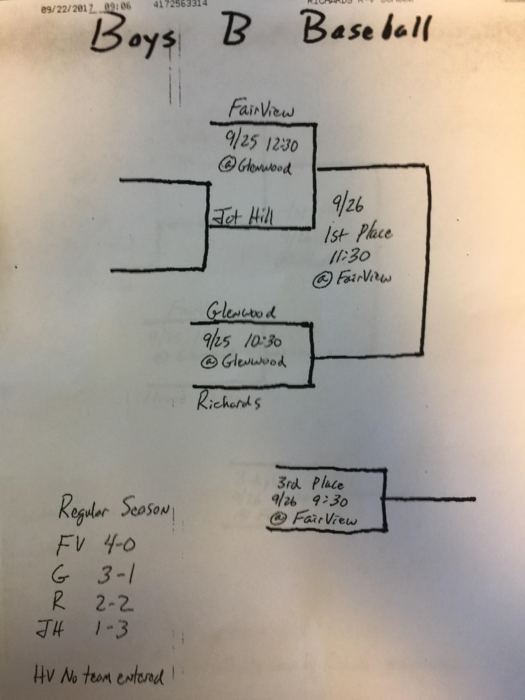 From Glenwood Athletics: Tournament ballgames will be held TOMORROW at FAIRVIEW SCHOOL. B Team Boys 9:00, A Team Boys 12:30 and A Team Girls 2:00. 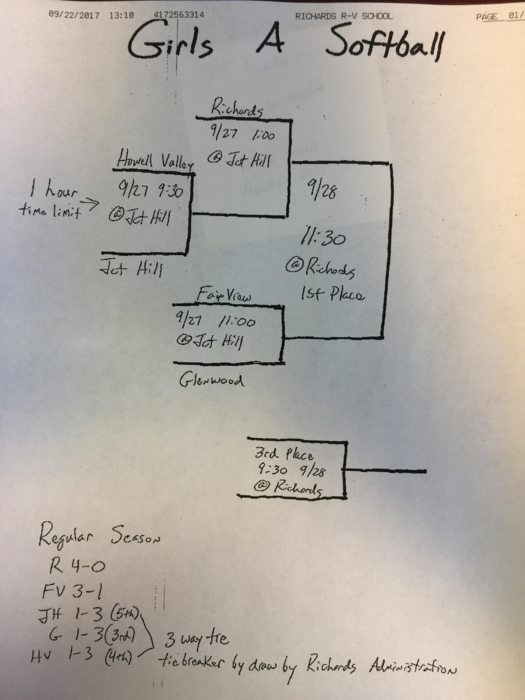 Tournament games on Mon., Oct. 1 at Glenwood and Wed., Oct. 3rd at Richards. Check our Facebook page for updates! All Glenwood after-school sports practices for today have been cancelled! No baseball/softball tournament games tomorrow. Follow our Facebook page for updates. Message from Glenwood Athletics: All tournament ballgames scheduled for Monday, Sept. 24th, have been postponed. All are invited to attend the Proportionate Share consultation and Public Meeting being held in the Glenwood Special Services office on Friday, September 28 at 3:45 p.m. Please contact Karen Moffis, Glenwood Special Services Director, with any questions. Today's ballgames have been CANCELLED due to rain and will not be made up! Watch our Facebook page for next week's tournament schedule. The Glenwood Mustangs will host the Koshkonong Blue Jays on Friday, Sept. 21st. A-Team games will begin at 1:00 p.m. with B-Team games to follow. There will be a concession stand! Go Mustangs! 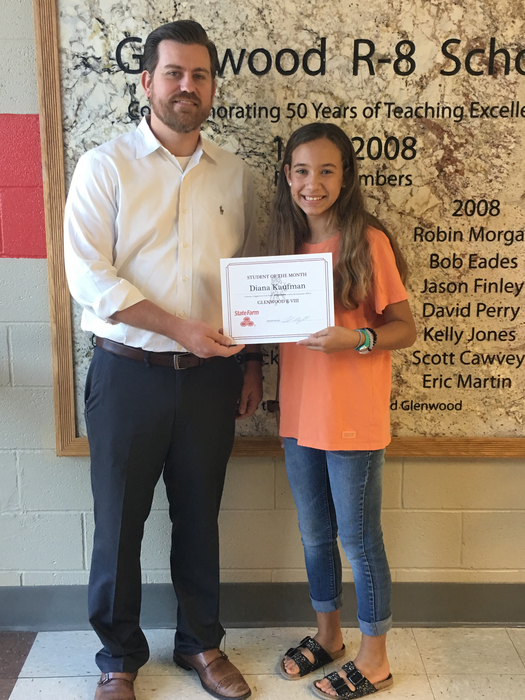 Glenwood Student of the Month-September Diana Kaufman 8th grade Daughter of Brian & Amy Kaufman Extracurricular Activities: Cheerleading, Volleyball, Track, BETA Club Diana has a very positive attitude and is always willing to help others. She is always friendly and helpful to underclassmen and younger students. She spends her mornings taking preschoolers and kindergarteners to breakfast and helping them get their trays, open their containers and start their morning out right. Diana is determined and stays on top of her school work, keeping her grades high while still participating in extracurricular activities. She is extremely pleasant and has an exceptionally good attitude. Diana does all the little things right and really represents what a Mustang is. Pictured below is Diana receiving a certificate from State Farm Insurance representative, Adam Mansfield. 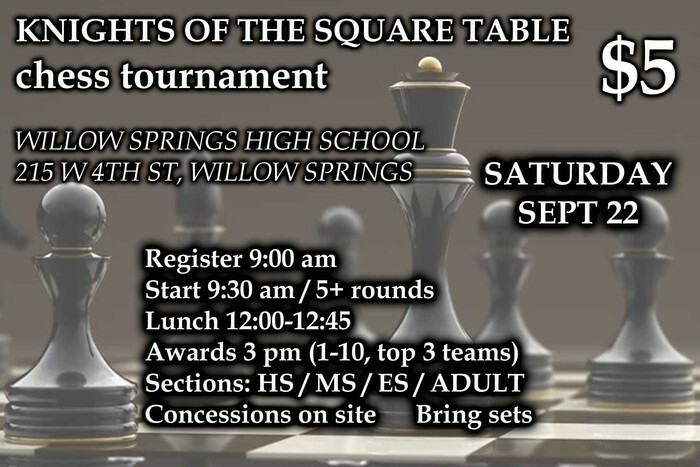 If you play chess and would like to participate in the Nights of the Square Table Chess Tournament, send notification to Teresa Shipley or call Glenwood School by Thursday, September 20 for pre-registration. Go Glenwood Knights!!! 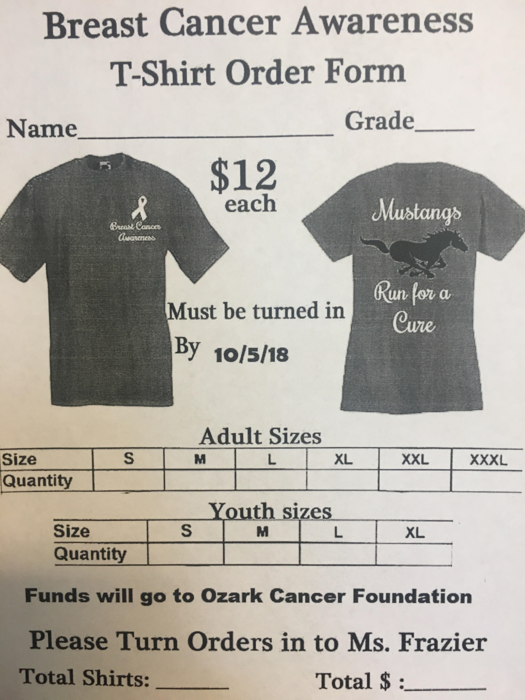 Mini-Mustangs - Please turn in your sign-up forms and money to Mrs. Danahy by Wed., Sept. 19th! Reminder!! Monday, September 17th is a teacher in-service day and there will be NO SCHOOL!! SPORTS REMINDERS FOR TUESDAY, SEPT. 11TH! -Baseball/Softball practice will be held until 4:15 p.m. -Baseball/Softball team pictures with Hilburn Photography will be taken after school. Don't forget to bring your UNIFORMS and PICTURE ENVELOPES! -Cross Country runners will have pizza at 4:15 p.m. Turn in your $2 to Coach Kutter. -Cross Country meet at WPHS - bus will leave Glenwood at 4:30 p.m. Running times are as follows: 7/8 Girls 5:30 7/8 Boys 5:50 5/6 Girls 6:10 5/6 Boys 6:30 All runners need to be picked up at WPHS by 6:45 p.m. Thank you! Go Mustangs! Running practice for today, Monday, Sept. 10th is cancelled due to ballgames! Thanks! Baseball/Softball game reminder!! The GW vs HV makeup games will be today with A Team beginning at 1:00 p.m. There will be a concession stand! Grandparents Day Breakfast! All grandparents are invited to a free Grandparents Day Breakfast on Monday, September 10th beginning at 7:45 a.m. Cinnamon rolls, little smokies, fruit juice and milk will be served. We look forward to see you! The Baseball and Softball games scheduled for today have been postponed until Monday, Sept. 10th at 1:00 p.m.
Glenwood School Fall Picture Day is tomorrow, Thursday, Sept. 6th. Don't forget your envelopes! All are invited to attend!!! 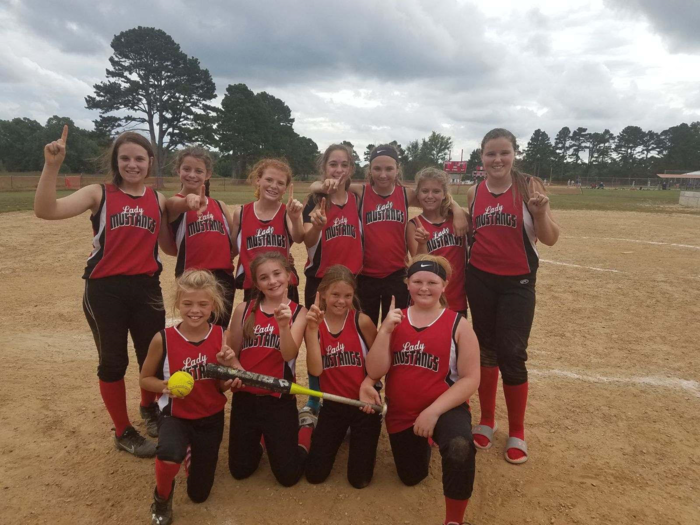 The Glenwood C-Team Baseball and Softball teams will play Thursday, Sept. 6th at Fairview beginning at 4:00 p.m. A bus will transport players to the game but all players will need to be picked up at Fairview after the games. Games have a one hour limit and should be completed by 6:00 p.m. Contact Coach Browning if you have any questions. Go Mustangs! Picture Day is Thursday, Sept. 6th! Picture envelopes were sent home last week and must be returned by Thursday morning. All after-school sports practices for today have been CANCELLED due to expected storms. 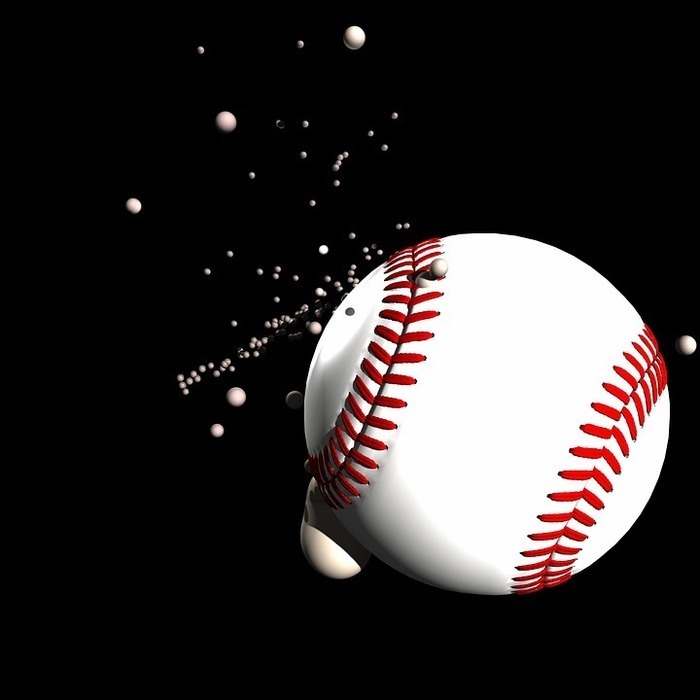 Baseball and Softball games will be tomorrow, Friday, August 24th, at Junction Hill School. A-Team games will begin at 2 p.m. with B-Team games to follow. Go Mustangs! Sports practices for today, Monday, Aug. 20th, have been cancelled. The athletic parent meeting scheduled for today has been postponed until Tuesday, Aug. 21st at 5:00 p.m.
Parents of baseball, softball, and cross country athletes are invited to attend a parent meeting Monday at 5:00 p.m. in the Glenwood gym. The meeting should last 10-15 minutes. 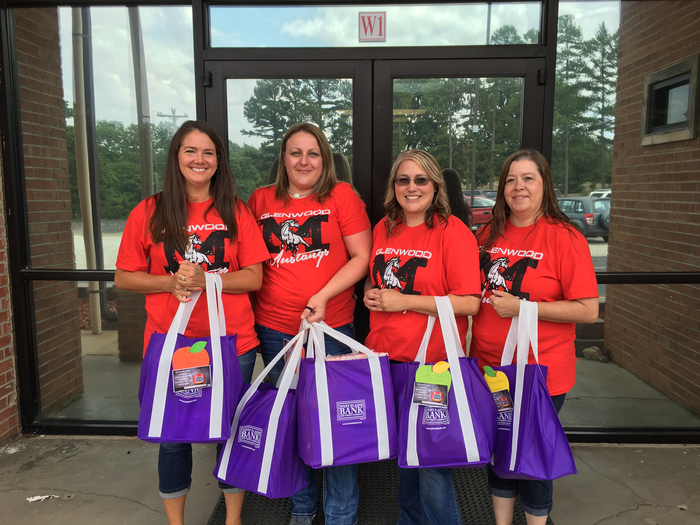 Glenwood R-8 Preschool, Kindergarten, and First Grade teachers were happy today to be visited by representatives of West Plains Bank and Trust Company whose employees worked diligently to gather classroom supplies for early elementary students who will be starting school this week! 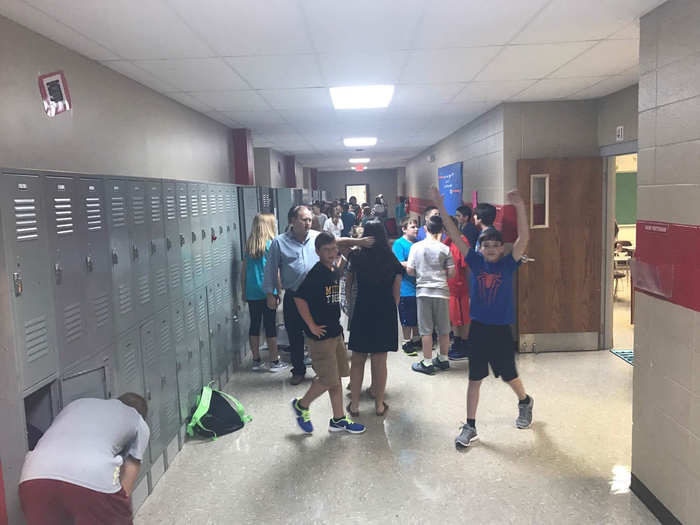 We want to invite all students and families to our Open House set for Monday, August 13th, from 5:30-7:00 p.m. We have made improvements to our campus and our teachers have done an amazing job of creating an outstanding learning atmosphere for our students. Please come and meet your child's teacher and check out our campus. Our school Board will be grilling hot dogs, so swing in and grab a snack. We look forward to seeing you on Monday evening! Go Mustangs! Important dates to remember: New student enrollment will be held August 6th-8th from 8:00 a.m. - 3 p.m. Please bring proof of residency, birth certificate and shot record. Open house will be held Monday, August 13 from 5:30 p.m - 7:00 p.m. The first day of school is Thursday, August 16th. First bell rings at 8:05 a.m. and parent pickup will begin at 3:35 p.m. See you all soon! 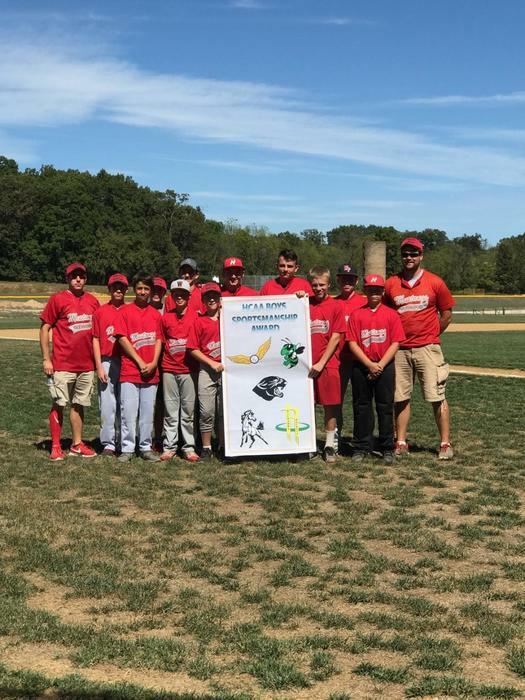 Glenwood Boys Baseball Practice August 2nd and 3rd from 8 - 10 a.m. Open to all 5th through 8th grade Glenwood boys interested in playing baseball. Glenwood Boys Baseball Camp August 6th-8th from 9-11 a.m. Open to all 5th through 8th grade Glenwood boys interested in playing baseball. Drink plenty of water and bring anything you will need to play baseball. Let me know if you have any questions. Thanks, Coach Neldon. Attention Freshmen!!! Zizzer Day for incoming freshmen at West Plains High School will be Tuesday, August 14th. A bus will be at Glenwood at 7:15 a.m. to transport students, if needed. Zizzer Day will dismiss at approximately 12:50 p.m. and the bus will return to Glenwood immediately thereafter. If you have any questions, please call WPHS at 256-6150. Glenwood School is currently accepting in-district pre-schoolers for full day Pre-School for the 2018-2019 schoolyear. Please call 256-4849 to register! Class rosters for pre-school through 5th grade are now posted in the school lobby and available for viewing. Happy summer break! Remember, all 5th-8th grade students interested in playing sports next year will need to complete a sports physical by the first day of school. Free sports physicals will be available to all students at the Shaw Building on July 19th. More information will be available soon. Check our Facebook page or Glenwood School app to stay informed! The last day of school will be Thursday, May 17th. All parents are invited to eat breakfast with us that morning from 7:45 a.m. to 8:30 a.m. Following breakfast there will be end-of-year award ceremonies at the times below: 1st-2nd grades 8:30 a.m. 3rd-5th grades 9:30 a.m. 6th-7th grades 10:30 a.m. School will dismiss at 12:15 p.m. Enjoy your summer!!! We will see you back on August 16th! Don't forget!!! Tomorrow is Fine Arts Day at Glenwood School. 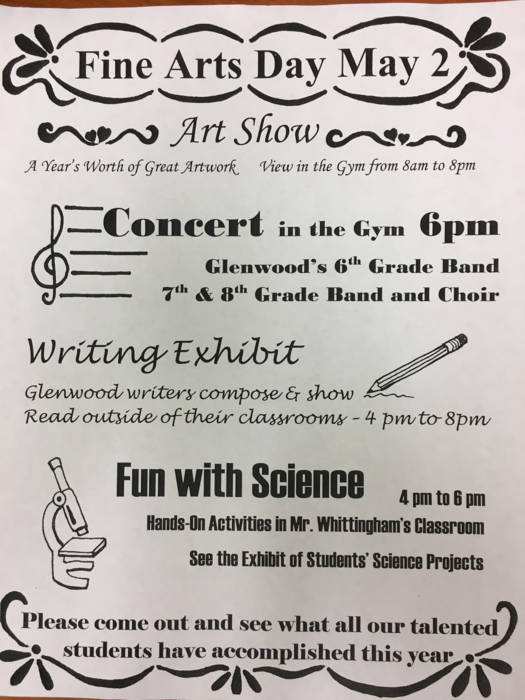 Artwork and writing will be on display until 8:00 p.m. and the Spring Music Concert will be held at 6:00 p.m. in the gym. Also, the Scholastic Book Fair will be open after school until 6:00 p.m. We look forward to seeing everyone! 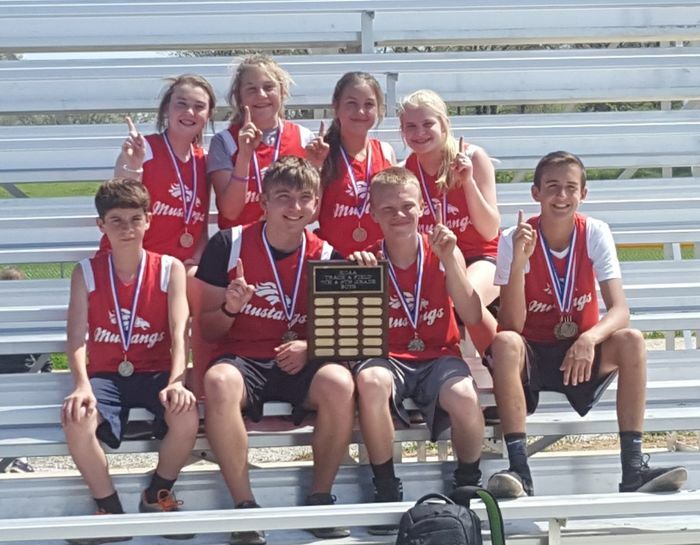 Congratulations to the 7th and 8th grade track team members who competed in the HCAA Conference Track Meet held Tuesday, May 1st at the Richards Sports Complex. It was an amazing day for our Mustang athletes! Aiden Brigman won 1st place in each of his events earning a perfect score and receiving All-Conference, Dylan Robertson and Steven Zuchowski received All-Conference. The Girls 4x400 relay team (Emily Cecil, Brooklyn Mead, Emmy Brashear and Abby Ford) won 1st place. Corbin Baker won 1st place in the 2 mile run. The Boys are Conference champions, AND they won the Sportsmanship Award again (that's 4 out of 4!!!). It's been a great year for this group of young men! 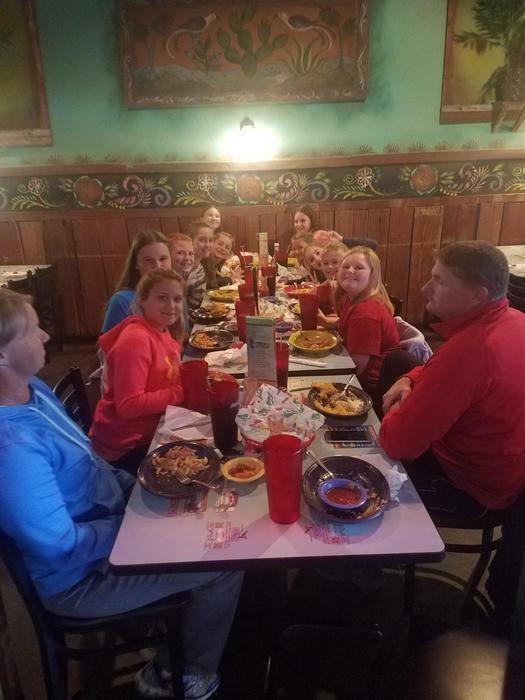 Congratulations to all of the 5th and 6th grade track team members who competed in the HCAA Conference Track Meet held Monday, April 30th. The following athletes placed FIRST in their events. 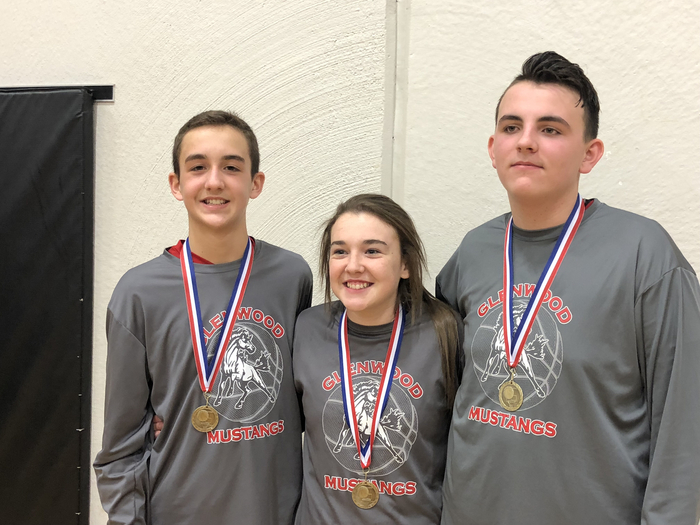 Matthew Holloway - 200 M Dash, Long Jump & High Jump Dylan Brigman - Shot Put & Discus Jessie Keith - High Jump Kailynn Parmer - Shot Put Way to go, Mustangs! 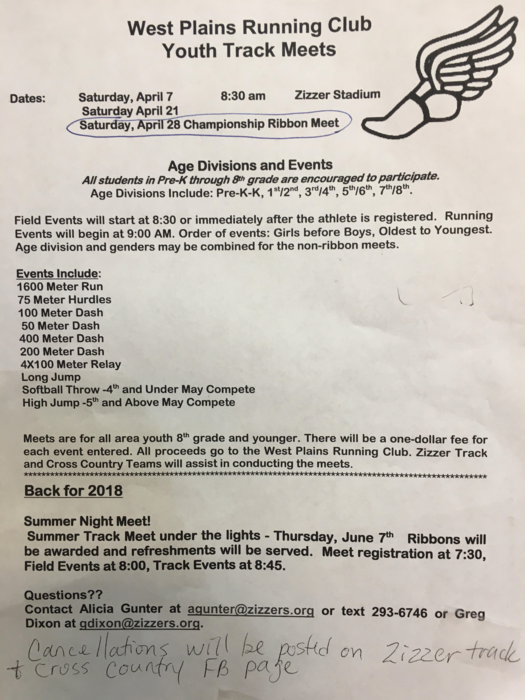 The 7th/8th Grade Conference Track Meet will he held Tuesday, May 1st at the Richards Sports Complex. Events will begin at 9:00 a.m. The MAP BBQ has been moved to Wednesday, May 2nd!!! With the threat of severe weather on Thursday, the end-of-MAP testing reward day has been moved up a day. Students need to dress for outdoor activities and wear sunscreen. 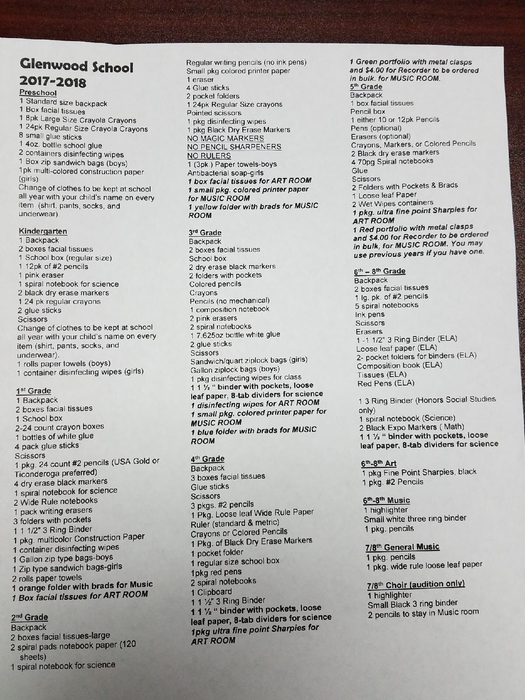 You can find the list of items needed in the attached photo. Thanks, everyone! 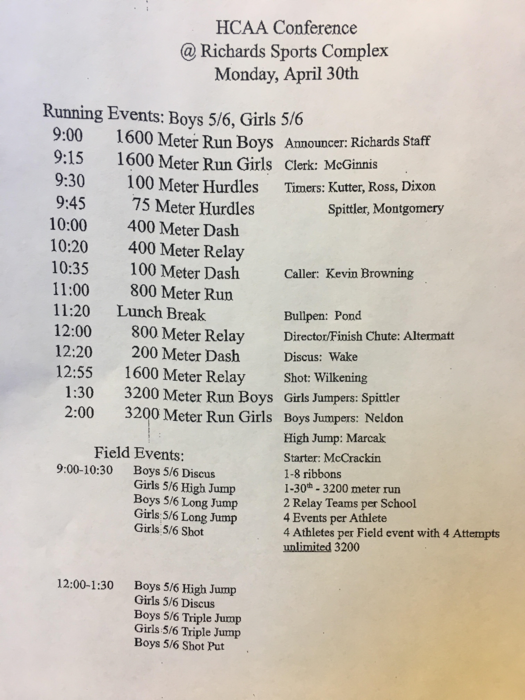 The 5th/6th Grade Conference Track Meet is today at the Richards Sports Complex. Events begin at 9:00 a.m. 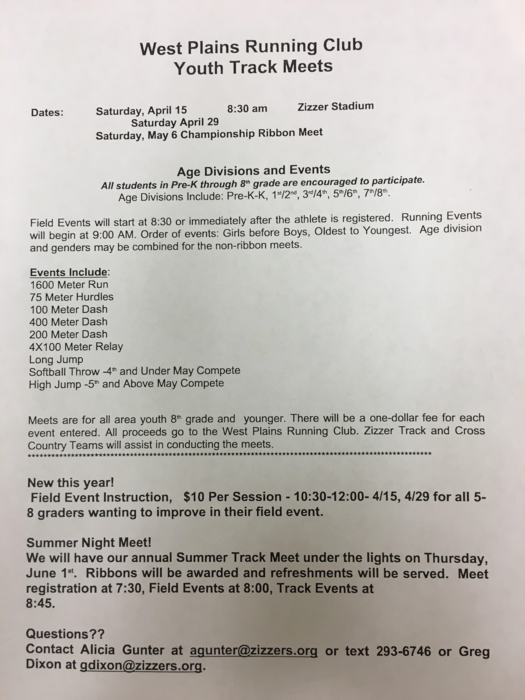 The West Plains Youth Track Championship Meet is Saturday, April 28th. See photo for schedule and information. 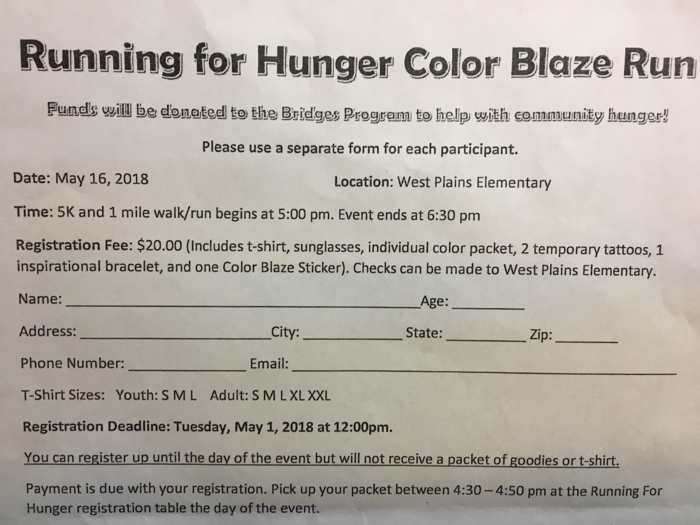 Anyone interested in participating in the "Running for Hunger Color Blaze Run" can pick up a registration form from Coach Kutter. Deadline for pre-registration is Tuesday, May 1st. All are invited to attend the Proportionate Share Consultation and Public Meeting being held in the GW Special Services office on May 1, 2018 at 4:00 p.m. Please contact Karen Moffis, Glenwood Director of Special Services, if you have any questions. Track practice for today, Monday, April 23rd has been cancelled. 7th graders will begin MAP testing Tuesday, April 17th. Rest up and eat a big breakfast! Good luck to all students! Reminder: There is no school Friday, April 13th and Monday, April 16th. We will see everyone back to school Tuesday the 17th. Enjoy your break! Kindergarten and 8th grade graduation cap & gown portraits will be taken Wednesday, April 18th at 8:00 a.m. Picture envelopes are being sent home with all K and 8th grade students today. 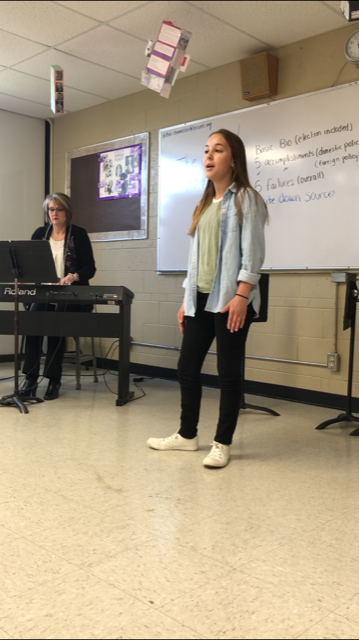 Glenwood Mustang Emily Cecil recently participated in the Zizzer Pride Music Festival at WPHS and earned a 1 rating for her solo performance! Congratulations, Emily! The TRACK MEET that was scheduled for today has been CANCELLED due to the threat of severe weather. TRACK PRACTICE has been cancelled for today, April 2nd. STEAM Night at Glenwood School! Join us for a family engagement activity this Thursday, April 5th at Glenwood School. There will be a variety of Science, Technology, Engineering, Arts, and Math activities for all students. Registration begins at 5:15 p.m. in the cafeteria and sessions will be a drop-in format from 5:30-7:00 p.m. For more information contact Mrs. Tackitt. 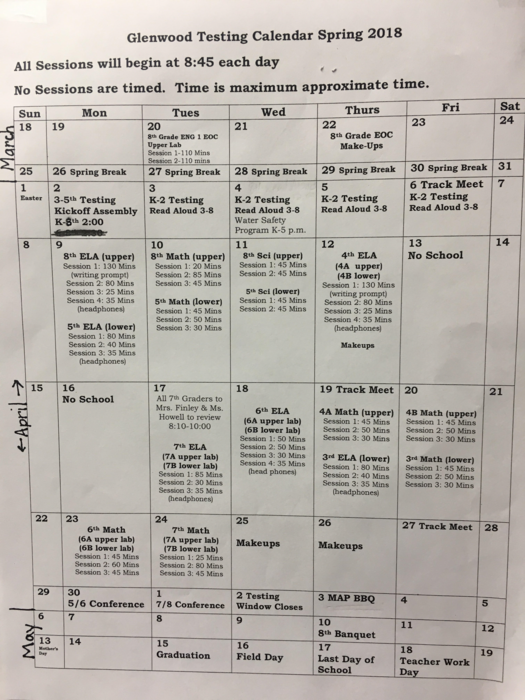 Information about the school-wide testing calendar will be sent home today. K-2nd grade testing will begin this week and 3rd-8th MAP testing will be throughout the following weeks. All test sessions will begin at 8:45 a.m. each day. If you have any questions, please call our Testing Coordinator, Mariah Hayes. Congratulations to Aiden Brigman for WINNING the Pentathlon at the Howell Valley Track Meet. This new event included 100 M Hurdles, 800 M Run, Long Jump, High Jump, and Shot Put. Steven Zuchowski placed 4th, JD Sydow 8th, and Emalee Brashear took 6th in the girls division!! These Mustangs competed hard all day and represented Glenwood well! TRACK PICTURES will be taken tomorrow, Wednesday, March 21st. All track athletes need to bring shorts/sweats and shoes. Jerseys will be handed out that day. Our first track meet will be this Friday at West Plains High School. Make sure to follow our Facebook page for updates! Thanks, Coach Kutter. NO TRACK PRACTICE TODAY, Monday, March 19th, due to poor track conditions from recent heavy rain. Thanks! 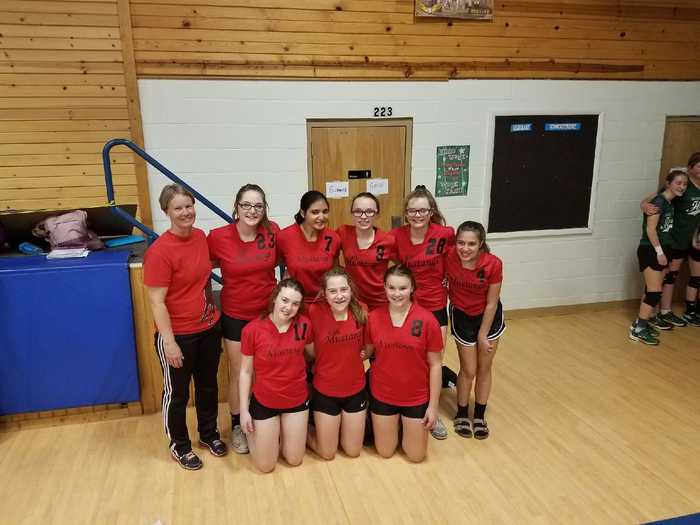 The Glenwood Lady Mustangs volleyball teams wrapped up their season with the HCAA tournament this week. 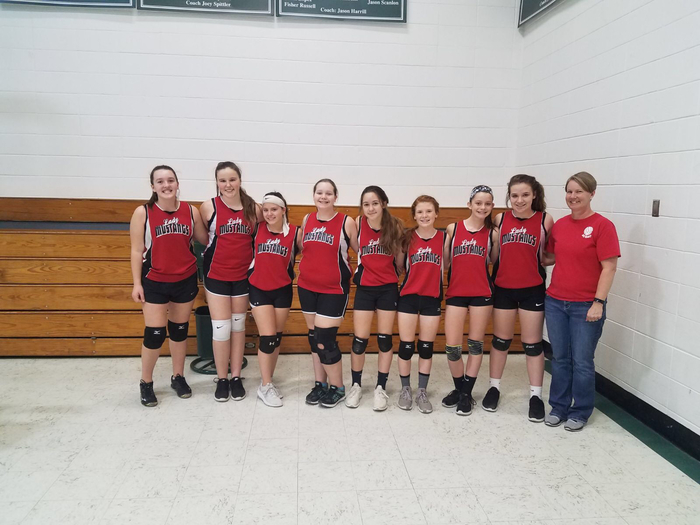 Congratulations to Coach Kutter and her A and B team players for a great season! 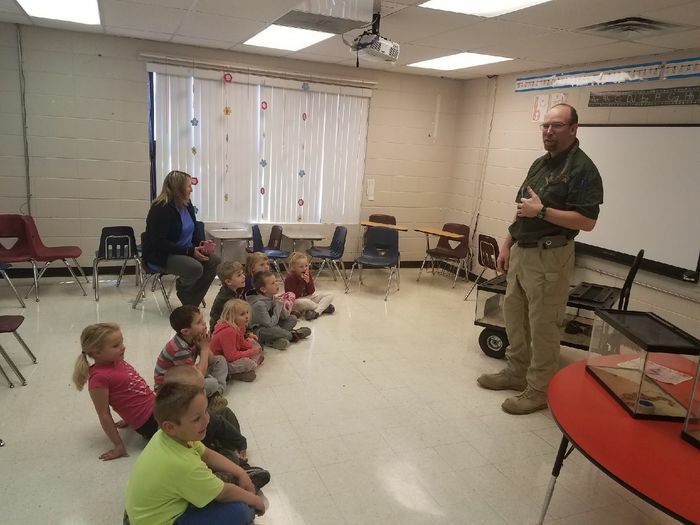 Matt Kantola from the Missouri Department of Conservation enthralls Glenwood Kindergartners with his displays of venomous and non-venomous Ozarks snakes! Glenwood School Bus 8 is running late today. If your child rides the bus 8 route there will be delays. Thank you! UNDEFEATED! 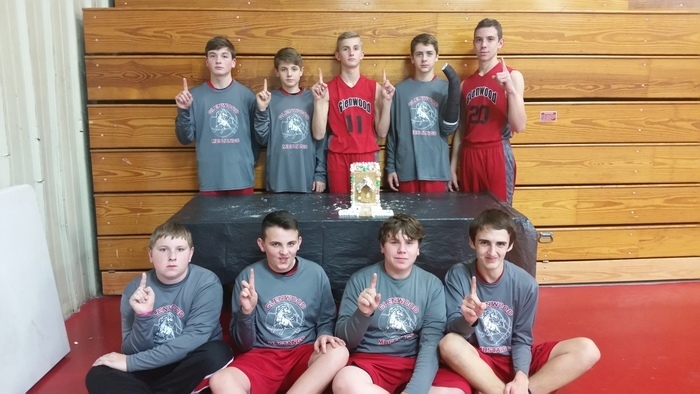 The 6th grade boys PeeWee team went 4-0 in conference play this season. The boys and Coach Neldon put in a lot of time and hard work to have a successful season! We can't wait to see what they do next! Way to go, Mustang Mathletes! 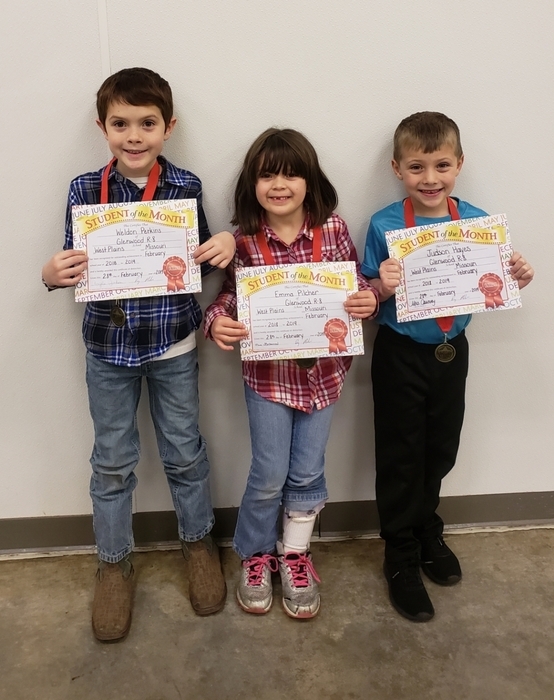 Pictured are students who participated in the annual rural school math contest, Math Matters, on Friday, March 2nd. Congratulations on a job well done, Mustangs! THE FROSTY FESTIVAL IS SATURDAY, FEB. 24!! The annual PTO Frosty Festival is tomorrow from 1:00-3:00 p.m. There will be carnival games, a bounce house, raffle items, and silent auction baskets. Tickets are $.25 and armbands are $5. Don't forget to donate to your favorite King and Queen candidates! We will crown a PreK-2 AND a 3rd - 5th King and Queen! Come join the fun! There will be NO CHOIR practice after school today! No Boys PeeWee Practice! Due to weather concerns, today's Boys PeeWee practice has been rescheduled for Friday, Feb. 23rd. Just a reminder: NO SCHOOL Friday, February 16th for a teachers' meeting and NO SCHOOL Monday, February 19th for Presidents' Day. We will see you back to school on Tuesday, Feb. 20th! 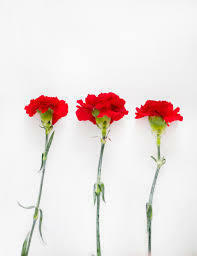 8th grade will be pre-selling carnations Monday and Tuesday of this week. The flowers will be delivered during classroom parties on Valentine's Day, Feb. 14th. Red, white, and pink colors are available for $1.50 each. All proceeds go to the 8th grade class. 8th Grade Parent Meeting Reminder All 8th grade students and parents are invited to attend the Parent Night with West Plains High School. The meeting will begin at 6:00 p.m. in the Glenwood Library on Monday, Feb. 12th. Due to the expected bad weather the Frosty Festival has been postponed until Saturday, Feb. 24th. KRISPY KREME orders are here! You may pick up your order at the gym concession stand today until 7 p.m. during the volleyball games or Saturday, Feb. 10th at the Frosty Festival from 1:00-3:00 p.m. Thanks to all who supported the Glenwood Booster Club! THE FROSTY FESTIVAL IS SATURDAY, FEB. 10TH! The annual PTO Frosty Festival is tomorrow from 1:00-3:00 p.m. There will be carnival games, a bounce house, raffle items, and silent auction baskets. Tickets are $.25 and armbands are $5. Don't forget to donate to your favorite King and Queen candidates! We will crown a PreK-2 AND a 3rd - 5th King and Queen! Come join the fun! NO SCHOOL Wednesday, Feb. 7th due to inclement weather! Stay safe! 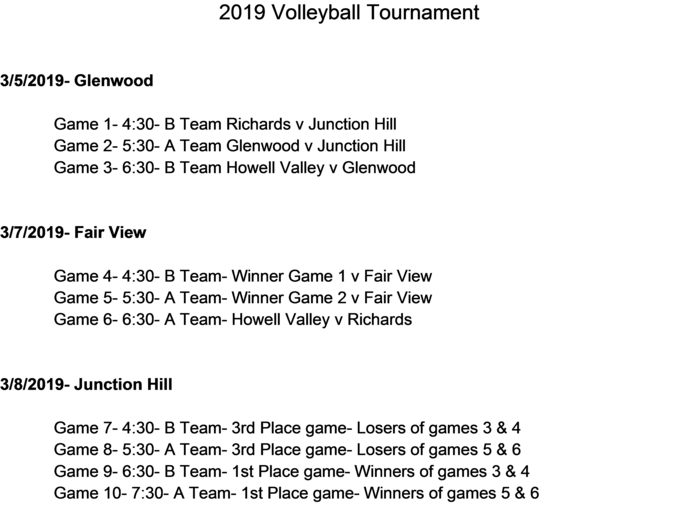 Progress reports for 6th-8th grades were sent home with students today. Glenwood will be dismissing early today due to weather concerns. Parent pickup will begin at 2:20 p.m. and buses will run shortly after. Stay safe! Due to weather concerns, all Glenwood after school activities for today, Tuesday, Feb. 6th, have been cancelled. This includes: tutoring, PeeWee games, Honor Choir practice, and BETA activities. Thank you and stay safe! All Booster Club Krispy Kreme fundraiser orders are due Tuesday, Feb. 6th. All money is due by Friday, Feb. 9th. Orders may be picked up Friday after school until 7:00 p.m. or Saturday during the Frosty Festival at 1 - 3 p.m. Thank you for your support of Glenwood Athletics! 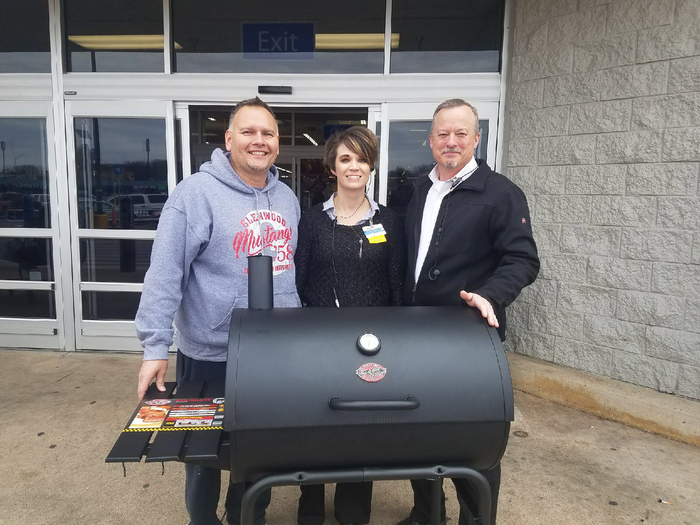 Wal Mart recently donated a charcoal grill to the Glenwood PTO for the annual Frosty Festival which will be held Saturday, February 10th from 1:00-3:00 p.m. Pictured presenting the grill to Glenwood Principal Denny Melvin is Assistant Store Manager Erin Rogers and Store Manager Trent Cockrum. Glenwood School K-5 progress reports will be sent home today. 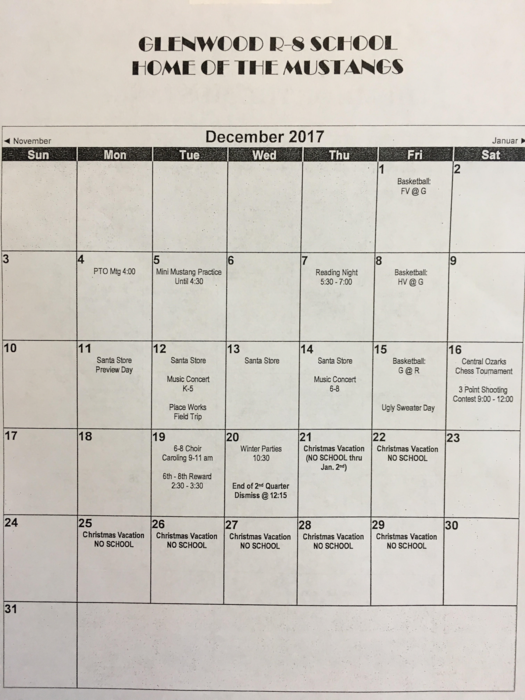 6th-8th reports will go out early next week. Thank you! Pre-School and Kindergarten screenings will be held March 1st and 2nd. Call for an appointment! Glenwood sports picture will be Friday, Feb. 2nd. Bring uniforms! For more sports info check the Glenwood Facebook page. Boys Pee Wee Basketball Information! HUNTER'S EDUCATION COURSE The Hunter’s Ed course will be offered at Glenwood School on Friday, February 16th. (School is not in session on this day.) Any student age 11 or older may sign up to attend this one-day training. Please see Coach Kutter to sign up! SECOND PLACE! 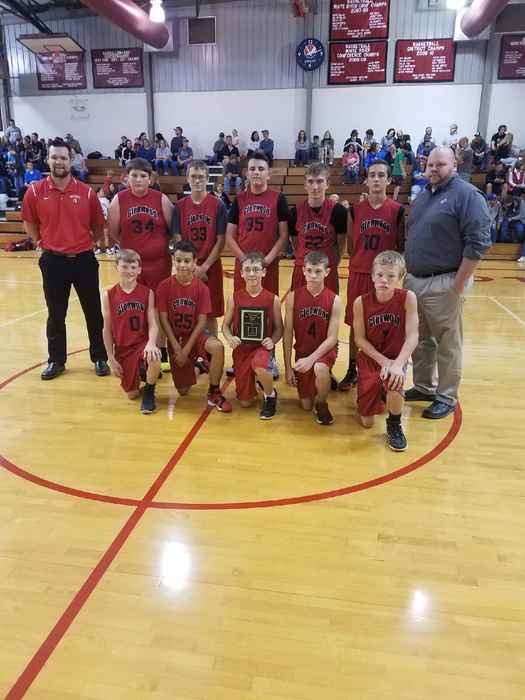 The Glenwood Boys A Team battled their way to the championship game, took second in the tournament, AND won the SPORTSMANSHIP award yet again! 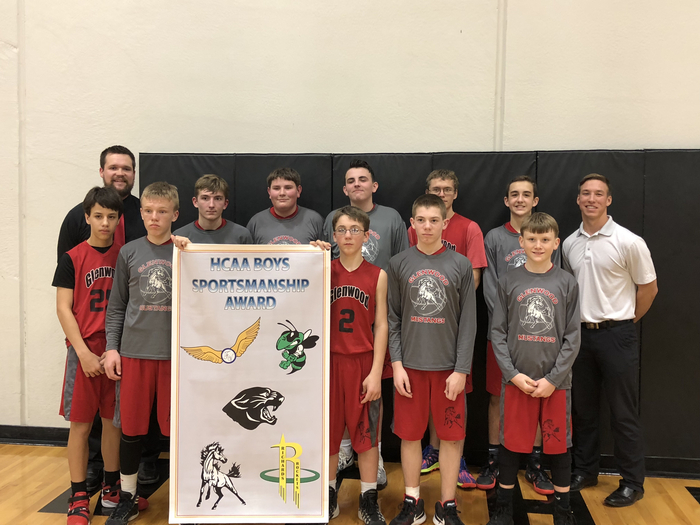 This is truly an amazing group of young men who represent themselves, their team, and Glenwood School exceptionally well on and off the court. Congratulations to the team, Coach Stetson Neldon, amd Asst Coach Zachary Kaufman. Proud to be a Mustang! 2018 All-Conference basketball medals were awarded to Aiden Brigman, Bristol Wood, and Emmy Brashear!! Way to work, Mustangs! 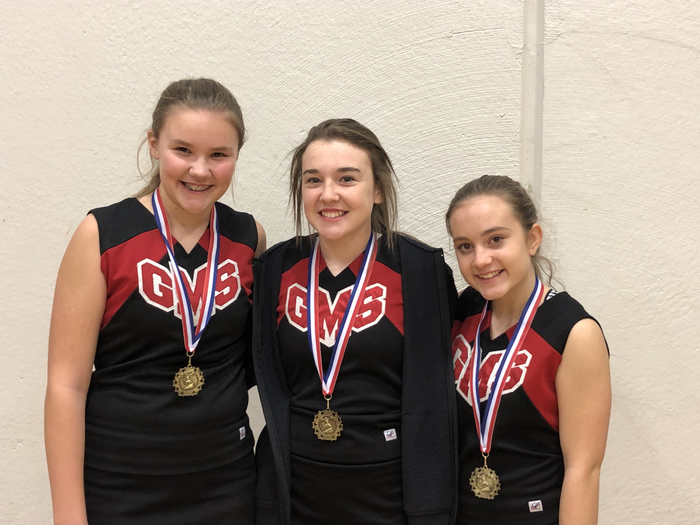 Congratulations to Adrianne Gastineau, Emmy Brashear, and Minnie Russell for receiving cheerleading all-conference awards. Excellent job, Mustangs! 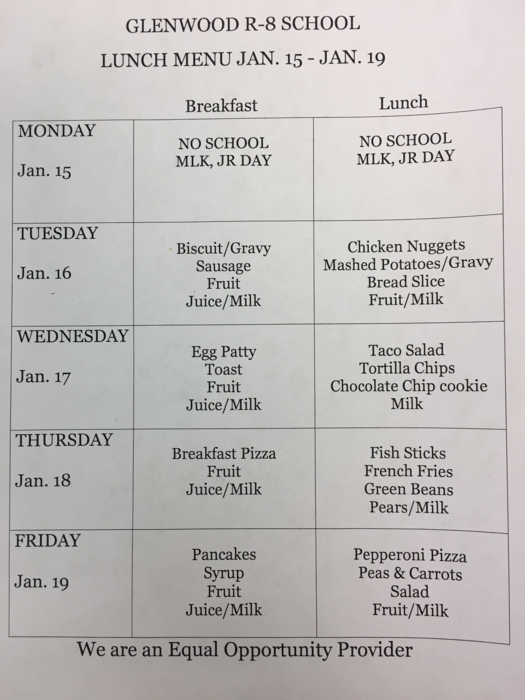 Lunch menu for the week of Jan. 29th - Feb. 2nd. Pre-School and Kindergarten Screenings will be held on March 1st and 2nd. If you have a child entering Pre-K or Kindergarten in the 2018-2019 school year please call Glenwood School at 256-4849 to schedule a screening. You will need to bring your child's birth certificate, immunization record, and proof of residency. Thank you! 8th grade parents: The parent meeting with WPHS that was to be held on Tues., Jan. 23rd has been cancelled. As soon as it is rescheduled we will let you know. Thanks! The Glenwood PTO will have their monthly meeting at 4:00 p.m. on Monday, January 29th. This meeting will be held in the library and all are invited to attend. NO SCHOOL Friday, Jan. 19th due to poor road conditions. A Team Basketball Tournament update: Games have been moved to Friday of this week and Monday and Tuesday of next week. As soon as school is back in session we will post more tournament information. Thanks! NO SCHOOL Thursday, January 18th due to poor road conditions. Everyone stay safe! NO SCHOOL Wednesday, January 17th. NO SCHOOL Tuesday, Jan. 16th. The A Team Basketball Tournament has been rescheduled to take place on Thursday and Friday of this week and on Monday of next week. Thanks! The Glenwood Boys B Team placed third in the tournament tonight. Good job, Mustangs! The Lady Mustangs B Team won third in the tournament tonight. Way to go, Mustangs! Just a reminder: There will be NO SCHOOL Friday, Jan. 12th for teacher in-service and NO SCHOOL Monday, Jan. 15th for Martin Luther King Jr. Day. We will see everyone back on Tuesday, Jan. 16th! 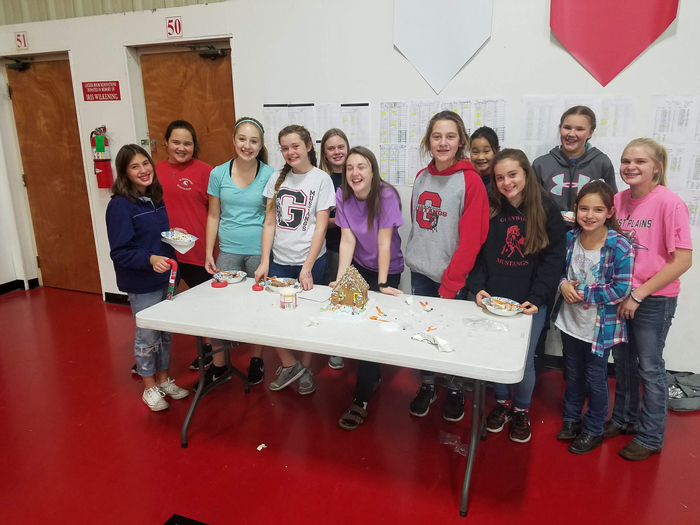 The winning group of the Gingerbread House Competition is pictured below. This is an annual event for the boys and girls basketball teams and cheerleaders. Great job, Mustangs! Classroom parties will begin at 10:30 a.m. Wednesday morning. School will dismiss at 12:10 p.m. and buses will run at approximately 12:25 p.m. We will see everyone back on Wednesday, January 3rd! Have a safe and happy holiday! The Booster Club food drive is going on now until Mon. Hams/turkeys are still needed. Friday is Ugly Sweater Day! 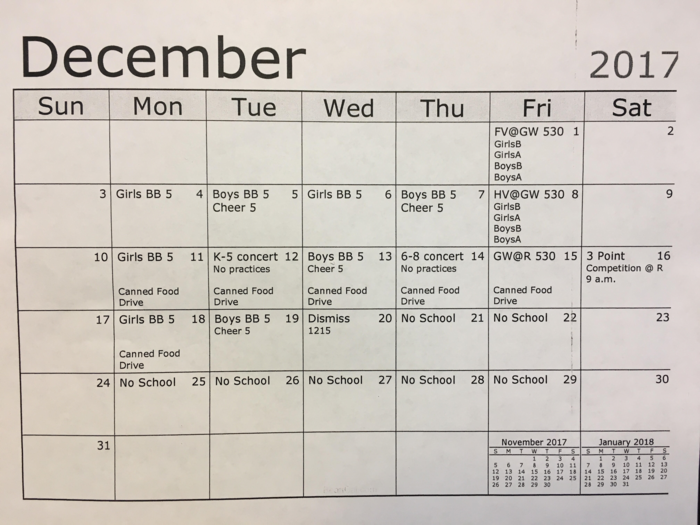 Class parties are next Wed., at 10:30 a.m. and school dismisses for break at 12:15. This Friday the Glenwood Mustangs will travel to Richards with the Girls B Team game beginning at 5:30 p.m. followed by the B Team boys, A Team girls, and A Team boys. There will be a bus for players and cheerleaders leaving after school and stopping at The Pizza Shack. The Glenwood Booster Club canned food drive will be held the week of Dec. 11-15th. This drive has, in the past, provided 5 or more Glenwood families with an entire holiday meal, laundry detergent and basket, and canned goods to last several weeks. The class who brings the most items will be awarded an ice cream party! Booster Club will distribute the baskets on the 18th. Please contact Stacy Kutter if you'd like to donate a turkey or ham. Thank you! This Friday, Dec. 8th, Glenwood will host Howell Valley in our final home game of the season. 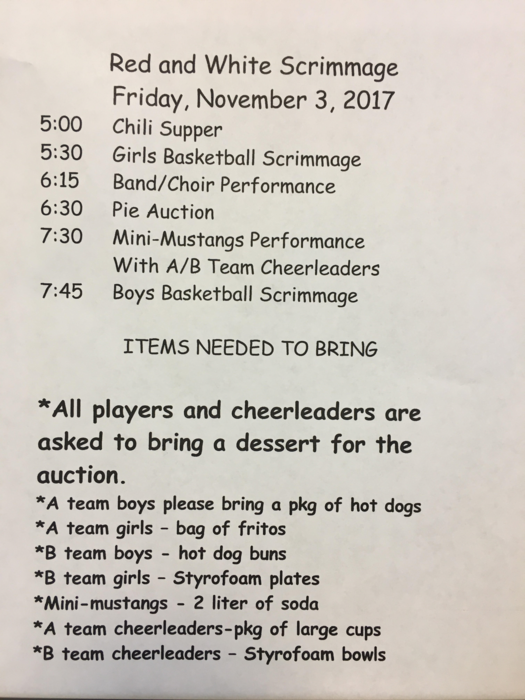 Parents of 8th grade basketball players and cheerleaders will be recognized between the A Team girls and B Team boys games around 7-7:30 p.m. Come out and support your Mustangs! 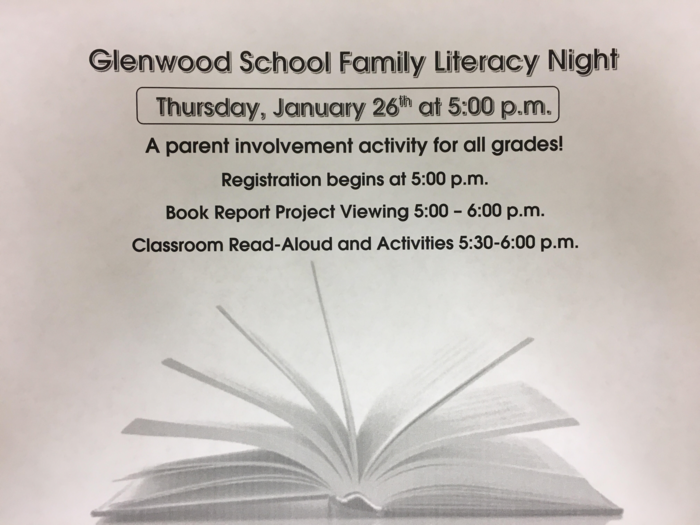 Glenwood School Family Literacy Night will be Thursday, December 7th with registration and activities beginning at 5:15 p.m. The classroom read aloud and activity session will be held from 6:00-6:45 p.m. Every child will get a free book and a reading detective kit! Snacks and drinks are provided and the Howell County Sheriff's Dept. will be here for free fingerprinting. Come join us for the fun! Mini Mustang practice is cancelled for today, Dec. 5th. Fall break will be Monday, Nov. 20th through Friday, Nov. 24th. We hope everyone has a safe and happy Thanksgiving holiday! We will see you back to school on Monday, Nov. 27th. Reminder for Friday, Nov. 10th: All students will be attending the Veterans Day Parade and should dress warmly. The Glenwood 7th-8th grade concert band and 6th-8th grade choir will be performing at the Veterans Day assembly at 2:45 p.m. Guest speakers include Jill Tate, retired Navy, and Andy Ingalsbe, retired Army. Please join us to honor our veterans! 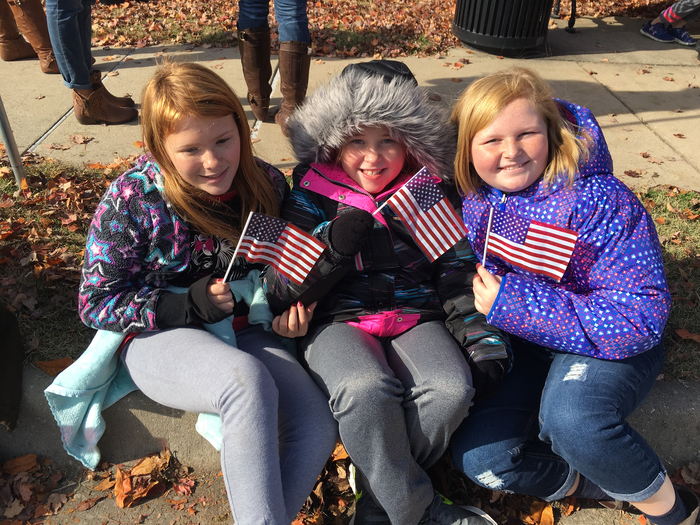 Veterans Day Activities for Friday, Nov. 10th: All Glenwood students will be attending the Veterans Day Parade. We will leave school at approximately 10:30 a.m. and return around noon. Also, there will be an assembly to honor our veterans at 2:45 p.m. in the gym. All are welcome to attend. Thank you for your Art To Remember orders. If you missed the deadline, you can still order online. Directions are on the order blank. Parents receive free shipping to the school during the late order window. Outside of that window, parents can order online at any time, but they'll just need to pay for shipping. The art department earns profits on all orders. If you have any problems with your order, please contact Mrs. Dawn King. 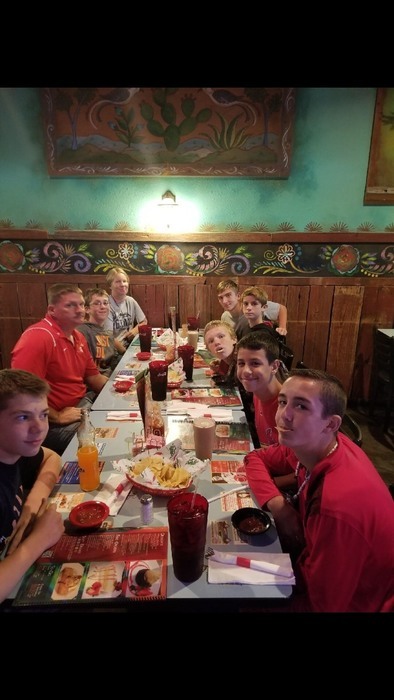 The Glenwood Cross Country Senior Boys Team was treated to a victory lunch today! Congratulations Conference Champs! Reminder: The Red & White Scrimmage will be Friday, Nov. 3rd at Glenwood School. 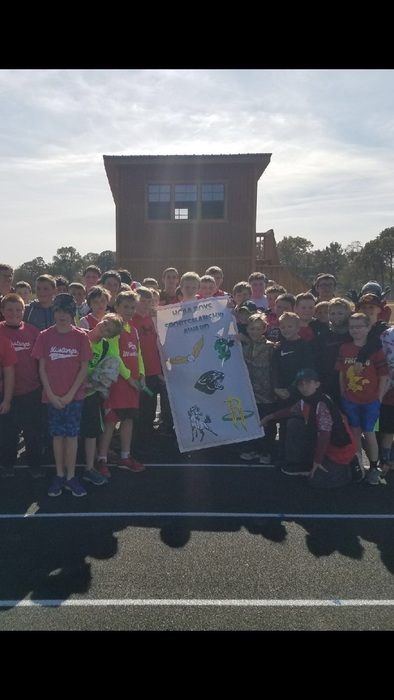 The Glenwood Boys won the Cross Country Sportsmanship award! (That is the second sportsmanship award in as many seasons!) You make us proud, Mustangs! 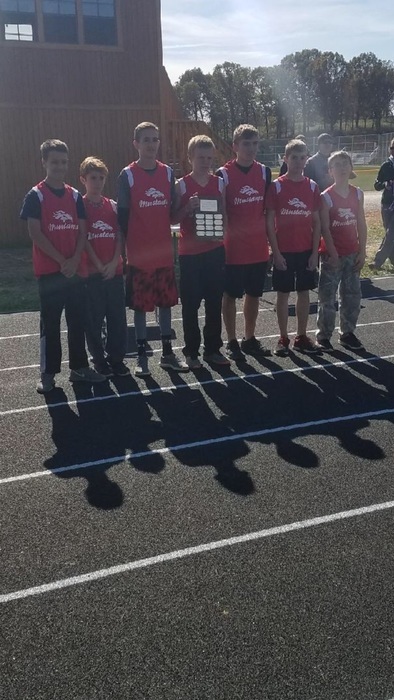 The Glenwood Senior Boys Cross Country team are Conference champs!! Way to work, Mustangs! Tomorrow is the Conference C/C Meet at Richards at 9. Dress warmly. Will return in time for fall parties at 2:45. No school Wednesday! Message from Mr. Melvin: Cooler weather is upon us, so please ensure that your children are dressed warmly when you send them to school. Recess is held outside and they will generally need a jacket or coat. Thank you! Go Mustangs! "Mustangs are Drug Free" is Friday's theme! It's Red & White Day! Wear your Mustang colors to support drug awareness and prevention during Red Ribbon Week at Glenwood! 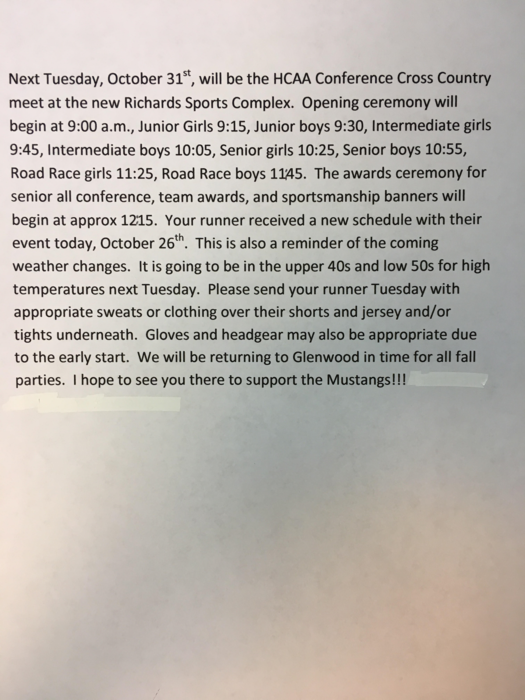 Conference Cross Country Meet Information for Tuesday, October 31st. "Your Future is Key, Stick with Me!" is Thursday's theme. It's Twin Day! Dress like a friend to support drug awareness and prevention during Red Ribbon Week at Glenwood! Cross Country Update: Due to weather concerns the Conference Cross Country meet originally scheduled for Friday has been moved to Tuesday, Oct. 31st beginning at 9 a.m. Coach Kutter will be sending updated schedules out Thursday. The meet will still be held at Richards Sports Complex. "It's Groovy to be Drug Free" is Wednesday's theme! Wear tie-dye to support drug awareness and prevention during Red Ribbon Week at Glenwood! There will be a Title I/Parent Involvement meeting tonight, Oct. 24th, at 5:30 p.m. in the Glenwood cafeteria. All parents are invited to attend. Refreshments will be served! 6th-8th grade cards that were not picked up at parent/teacher conferences were mailed home today. If you have any questions please don't hesitate to contact your child's teacher. Thank you! "Too Smart for Drugs" is Tuesday's theme! It's Nerd Day! Dress like a nerd to support drug awareness and prevention during Red Ribbon Week at Glenwood! "My Future is Too Bright for Drugs" is the theme for Monday. Wear your NEON and SUNGLASSES to support drug awareness and prevention during Red Ribbon Week at Glenwood! Congrats to our Mustangs Boys Basketball team for winning the consolation trophy at the Dora tournament! First quarter Perfect Attendance and Honor Roll awards assemblies will be Monday, Oct. 23rd. Parents are welcome to attend! The times are as follows: Grades 3-5 2:00 p.m. Grades 6-8 2:30 p.m. Thank you for your support and dedication to your children! 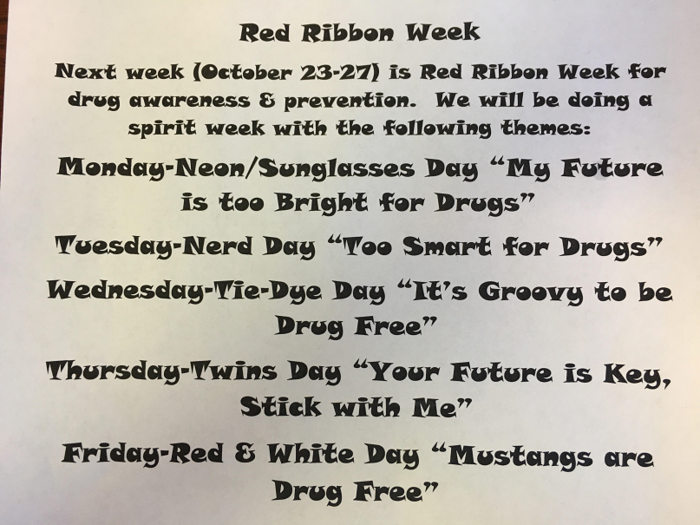 Red Ribbon Week for drug awareness and prevention is October 23-27! Reminder: Drop-in parent/teacher conferences for grades 6-8 will be held tonight from 4:00-8:00 p.m. Grade cards will be handed out at that time. Thank you. Glenwood Mustangs are encouraged to wear pink for our annual "Pink Out Day" in support of breast cancer awareness. BETA club will be selling snow cones and bracelets for $1.00 with proceeds going to the OMC Cancer Research Fund. Just a reminder: Drop-in conferences with middle school and specials teachers will be Thursday, Oct. 19th from 4-8 p.m. Grade cards can be picked up at that time. Thanks! Parent/Teacher Conferences for grades PK-5 have been scheduled for the week of Oct. 16-20. 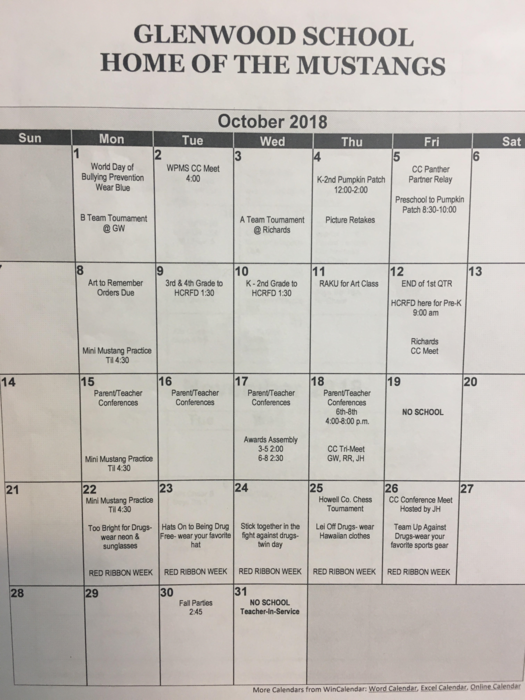 Drop-in conferences with 6-8th and specials teachers will be held Thursday, Oct. 19th from 4-8 p.m. Grade cards will be distributed at that time. Thank you! 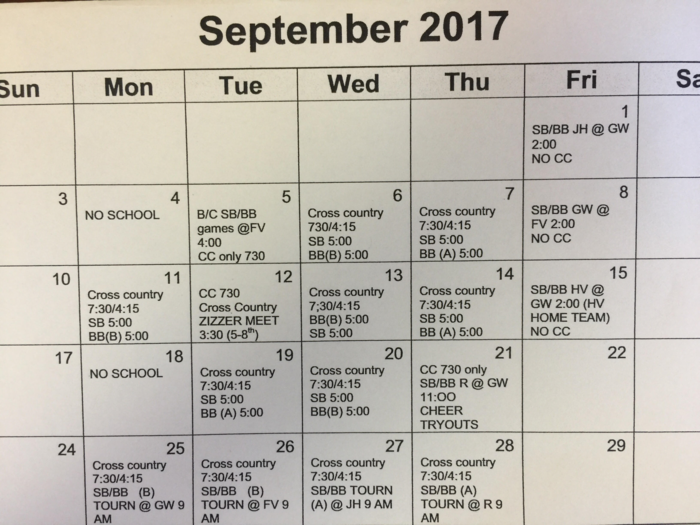 Cross Country Meet Information for Friday, Oct. 13th: All runners received their event schedules today. The meet schedule is below. Contact Coach Kutter with any questions. Art to Remember orders and payment are due today. Late orders will be accepted Tuesday morning only. Online ordering is also available. 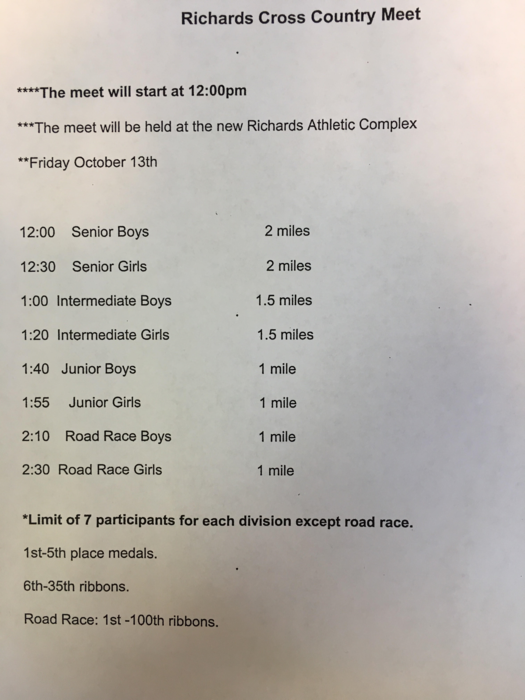 Updated after-school cross country meet information for Monday, Oct. 9th. Picture retakes will be Tuesday, Oct. 10th. Reminder: Boys Basketball tryouts for boys in grades 5-8 will be held Thursday, Oct. 5th and Friday, Oct. 6th until 5:00 p.m. each day. Due to inclement weather the middle school cross country meet scheduled for tonight has been rescheduled for Monday, October 9th. Fundraising forms for the Glenwood Music Department are being sent home today! All proceeds go towards the music program which includes beginning band, advanced band, and choir. Thank you! Monday, October 2nd, is World Bully Prevention Day. All Glenwood students are encouraged to wear BLUE for Bully Awareness and Prevention. 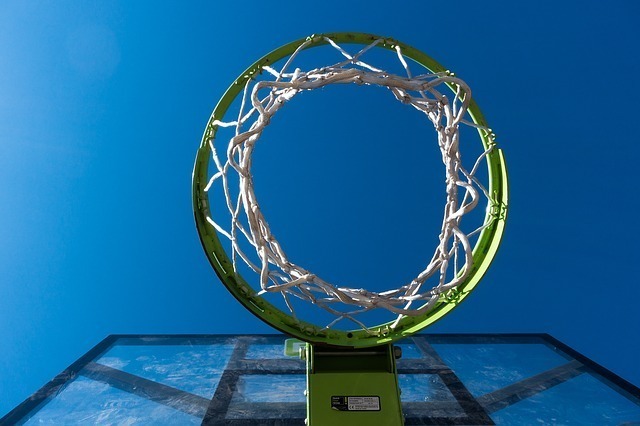 Boys Basketball Tryouts All 5th-8th grade boys interested in playing basketball will need to attend tryouts scheduled for Thursday, Oct. 5th and Friday, Oct. 6th. Tryouts will be after school until 5:00 p.m. each day. Contact Coach Neldon if you have any questions. 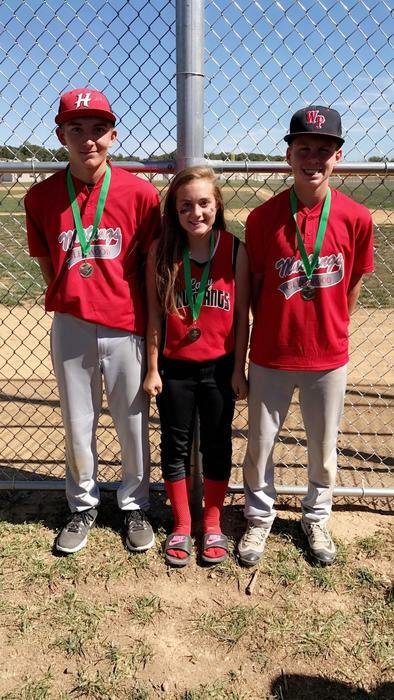 2017 Baseball and Softball Tournament Results A Team Boys - 3rd place B Team Boys - 2nd place A Team Girls - 4th place B Team Girls - 5th place Great job, Mustangs! 2017 All-Conference award recipients were Dylan Robertson, Minnie Russell, and Hunter McCullough. Excellent job, Mustangs! The Glenwood Mustangs Boys A Team were the recipients of the 2017 Sportsmanship Award. Way to go, boys! 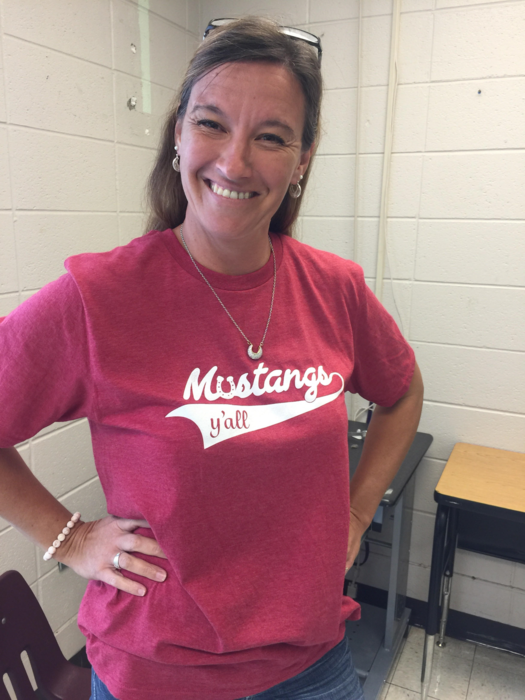 Last chance to get a Mustang t-shirt! Coach Kutter will be placing another t-shirt order Friday, September 29th. Order forms are going home today! Cost is $12. Boys B Team Baseball Tournament Brackets. Games begin Monday, September 25th. 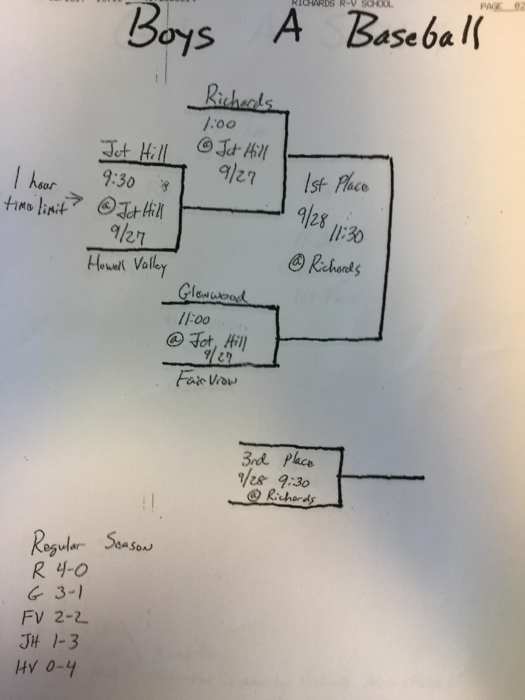 Girls B-Team Softball Tournament Brackets Games begin Monday, September 25th. All 6th-8th grade students will be attending the Homecoming Parade Friday, Sept. 22nd. The bus will leave Glenwood at approximately 1:00 p.m. and return by 2:30 p.m. The Glenwood Mustangs will host the Richards Rockets Thursday, September 21st. A Team games will begin at 11:00 a.m. with B Team games to follow. The concession stand will open at 1:00 p.m. Baseball and Softball sports pictures will be taken last hour on Wednesday, Sept. 20th. Order envelopes are going home today! Progress reports were distributed today. If you have any questions please contact your child's teacher. Also, just a reminder, there will be NO SCHOOL Monday, September 18th. Have a good evening. Friday is Game Day! The Glenwood Mustangs will host the Howell Valley Panthers Friday, Sept. 15th. A Team games will begin at 2:00 p.m. with B Team games to follow. Just a reminder: Wednesday, September 13th is Picture Day! Tomorrow's After-School Cross Country Meet location has been moved to Howell Valley! Cross Country After-School Meet Sept. 12th at Howell Valley School! 7/8th Girls run at 5:30; 7/8th Boys run at 5:50; 5/6th Girls run at 6:10; 5/6th Boys run at 6:30. Parents need to pick up at Howell Valley by 6:45 p.m. Thank you! PICTURE DAY IS WEDNESDAY, SEPT. 13TH!! Picture forms are coming home today. Please have those returned by Wednesday. Thank you! Cross County After School Meet Bus Info: There will be a bus taking runners to the meet after ball practice at approx. 4:15 p.m. Bring $2 for pizza and a drink. All students must be picked up by parents by 6:45 p.m. Thanks! Reminder: All booster club t-shirt and Coca-Cola fundraiser orders are due by Monday, September 11th. Contact Coach Kutter with any questions. Thanks! Message from Coach Browning Glenwood Softball and Baseball: There will be no practice tomorrow. The C-teams will be traveling to Fairview to play a doubleheader. Bus will leave around 3:15. Games should be over around 6. 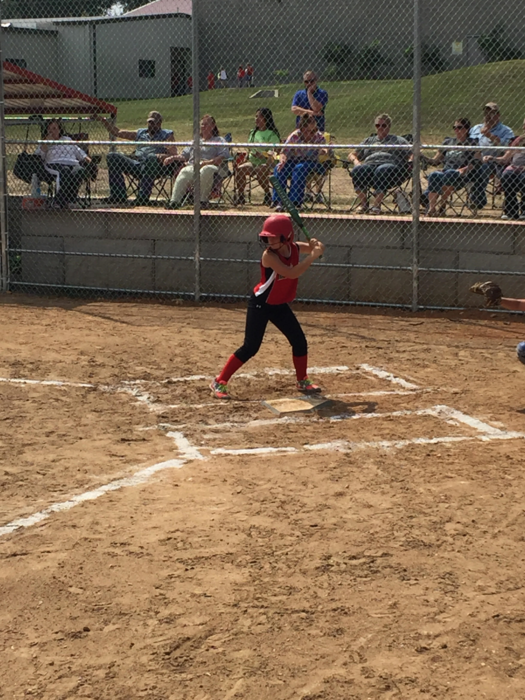 #27 Minnie Russell is the first Lady Mustang to step into the batter's box on the new softball field! 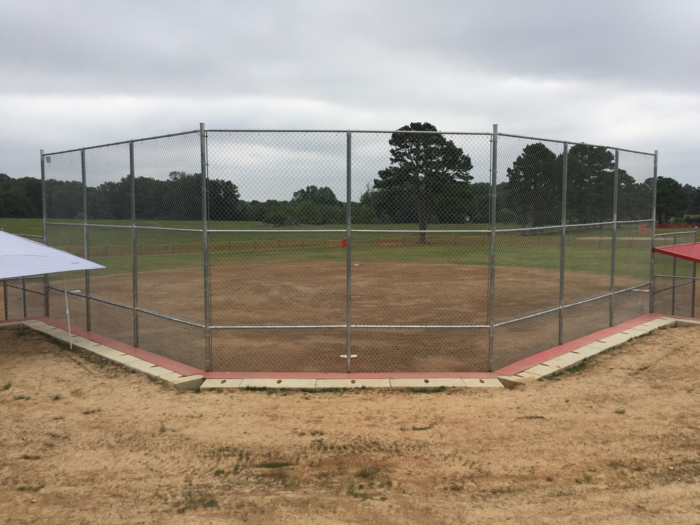 Thanks to everyone for helping make our softball field something to be proud of! Go Mustangs! It's Game Day! Glenwood Girls Softball and Boys Baseball teams will take on the Junction Hill Hornets today. A-Team games begin at 2:00 p.m. with B-Team games to follow. Concessions available. Attention all Girls Softball players: Tomorrow's game vs Kosh has been cancelled. There will be NO girls games. Boys games will go as scheduled with A team beginning at 2:00 p.m. and B team following. Baseball/Softball Parent Meeting A brief parent meeting will be held at 5:00 p.m. Thursday, Aug. 24th in the Glenwood Gym for all parents of baseball and softball players. Contact Coach Browning for more information. We had a great first day of school today! Ita going to be an amazing year to be a Mustang! We look forward to seeing everyone tomorrow! Just a reminder, breakfast is served from 7:45-8:05 a.m. First bell rings at 8:05 a.m. and instruction begins at 8:10 a.m. The Glenwood School faculty and staff for 2017-2018. Proud to be Mustangs! Open House is tonight! All parents and students are invited to drop in from 5:30-7:00 p.m. to meet your teachers and see your classrooms. Members of the Glenwood School Board will be serving free hotdogs and water. We look forward to seeing you! Baseball camp for today has been cancelled due to rain. Coach Neldon will see you the first day of school! Class rosters for grades K-5 are now posted in the school lobby. Students in grades 6-8 may pick up their class schedule and locker assignment at open house on Monday, Aug. 14th. Open house will be Monday, August 14th from 5:30-7:00 p.m. School begins on Thursday, August 17th. We are excited to see everyone! Enjoy the rest of your summer vacation, and we will see you soon. Glenwood School is a member of MOREnet as are most other area schools. The MOREnet internet loop is down and as we have a VOIP phone system phones are down too. We hope to have Internet and telephone services restored later today. Thank you! All parents and grandparents are invited to join us for a free breakfast (cinnamon rolls, little smokies, and blueberries) and awards Wed., May 17th, the last day of school! The schedule is as follows: Breakfast begins at 7:45 a.m. and lasts until the food is gone. 4th-7th grade awards begin at 8:30 a.m. and 1st-3rd grade awards begin at 10:30 a.m. We hope to see everyone! Field Day is tomorrow beginning at 12:30 p.m. Remember to dress for a warm day amd wear sunscreen. Parents are welcome! 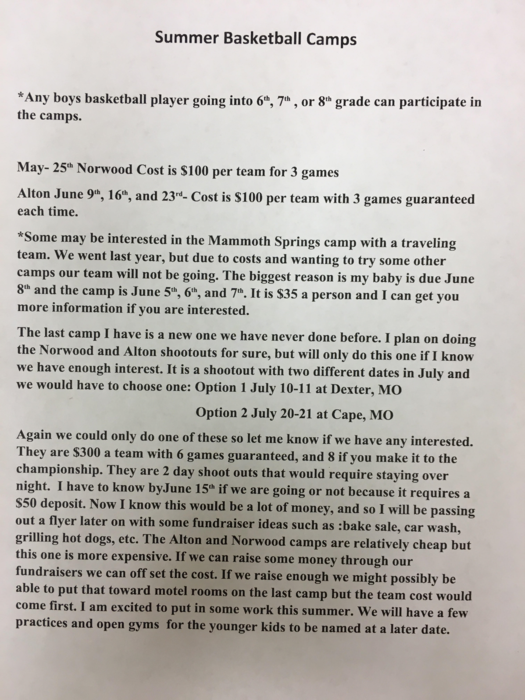 Summer Boys Basketball Information: *Our first camp is May 25th in Norwood *Fundraiser will be at Faith Assembly (beside Hirsch Feed & Farm Supply) May 20th from 9 a.m. - 1 p.m. We will grill, have a bake sale, and a car wash. Everyone needs to sign up to bring one of the following: hamburgers, hot dogs, buns, chips, drinks, plates *June 30th camp is at West Plains, cost is $85. *PEE WEE Open Gym for grades 4-6 will be 9:30- 11:00 a.m. June 15th, 22nd, 29th, July 13th, 20th. Reminder: 5th/6th Grade Conference Track Meet is Tuesday, May 9th. Our buses will leave at approx. 8:30 a.m. The meet will be held at Richards School's new athletic complex behind the Unemployment office in WP. There are no restroom facilities but portable restrooms will be provided. The concession stand will be open. Don't forget your lawn chairs! 8th Grade Awards Banquet is Thursday, May 11th. All 8th graders, parents and siblings are invited attend the meal beginning at 5:30 p.m. The school will provide the entrée, rolls and drinks. 8th grade boys should bring a side dish and 8th grade girls should bring a dessert. All 8th graders, parents, and extended family are invited to the awards ceremony, consisting of art, academics, and sports awards, beginning at 6:00 p.m. Sorry for any confusion. Please contact Mrs. Wright or Mrs. Hayes if you have any questions. Thanks! 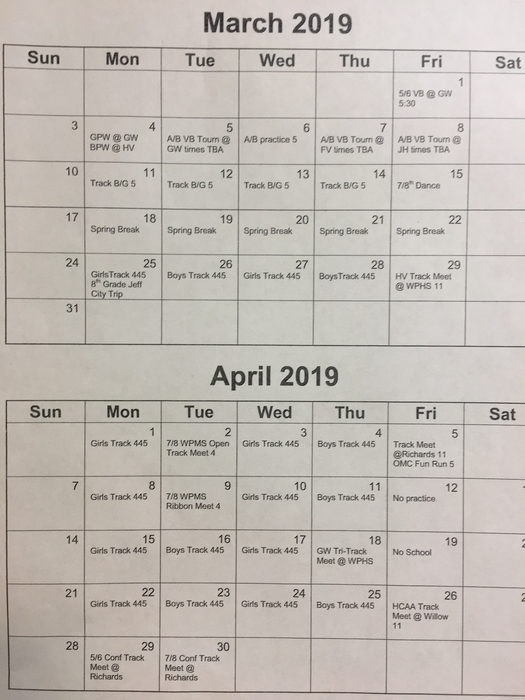 Attention 8th grade students and parents: Changes to the Schedule of Events for 8th grade Tuesday, May 9th – Track athletes will be working at the 5/6th conference meet and will need a lunch or can get one from the cafeteria. 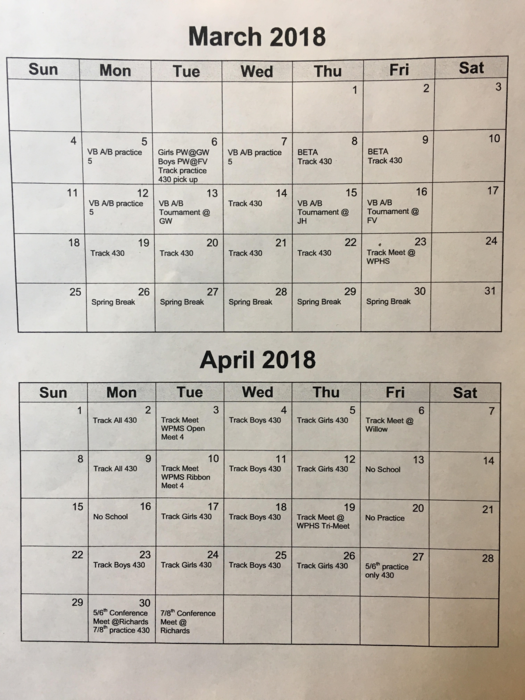 There is also track practice Tuesday night until 4:45 p.m. Wednesday, May 10th – 7/8th conference for track athletes. You will need a lunch or can get one from the cafeteria. Thursday, May 11th – Award night has been moved to different times. Pictures for Track, chess, math, and BETA at 2:00 p.m. Friday, May 12th – Last full day of classes – turn in all books. 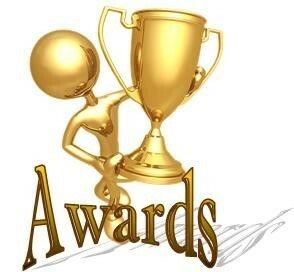 There will be a class award day (for art and sports awards) beginning at 2:45 p.m. in the gym. Monday, May 15th – graduation practice until 11:30 a.m., pizza for lunch. All 8th graders need to be picked up by 12:30 p.m. They also need to report to Mrs. Cawvey's room by 5:30 p.m. dressed in cap and gown. Awards and Graduation will begin at 6:00 p.m. in the gym. Tuesday, May 16th – Silver Dollar City trip – leaving at 6:00 a.m. and return 10:00 p.m.
Fine Arts Day will be Tuesday, May 9th. The art show will be open from 8 a.m. to 6 p.m. Student writing samples can be viewed after school until 6 p.m. Note: The band and choir concert has been cancelled. Pictures for track, chess, math team, and BETA will be Thursday, May 11th, beginning at 2 p.m. Picture envelopes will go home today. School will resume tomorrow morning. Secondary roads are still not in optimal condition so, if you don't believe that our buses can or should cross the roads or bridges necessary for the pick up of your student, please drop them off at school. Thank you for your continued patience as our entire state deals with the complications caused by historic amounts of rainfall. Good afternoon. Due to extensive damage to area roads and bridges, school will be canceled through the remainder of this week. Classes will resume on Monday, May 8th. Thank you and please stay safe! No school tomorrow, Tues., May 2nd, due to roads and bridges being washed out. Convoy of Hope will be at Faith Assembly tomorrow May 1st at 10 a.m. to distribute groceries and personal items. Distribution is for anyone who needs assistance in the West Plains and surrounding areas. School is cancelled for tomorrow, May 1, due to flooding and lack of electricity in the area. Attn 7/8th grade O.F.L. players: Football games scheduled for tonight have been cancelled. Parent pickup time is 12:30 p.m. today. Glenwood and other area schools will be dismissing early today due to the forecast for heavy rains overflowing already full creeks. High School Students will be loading at 12:30. Glenwood students will load at approximately 1 PM. The track meet that was scheduled for today has been postponed. As soon as it is rescheduled we will let you know! May 2nd is Fine Arts Day at Glenwood School! It's Easter Break! No school Friday, April 14th or Monday, April 17th! Enjoy your long weekend! PTO/Title I Meeting Today! 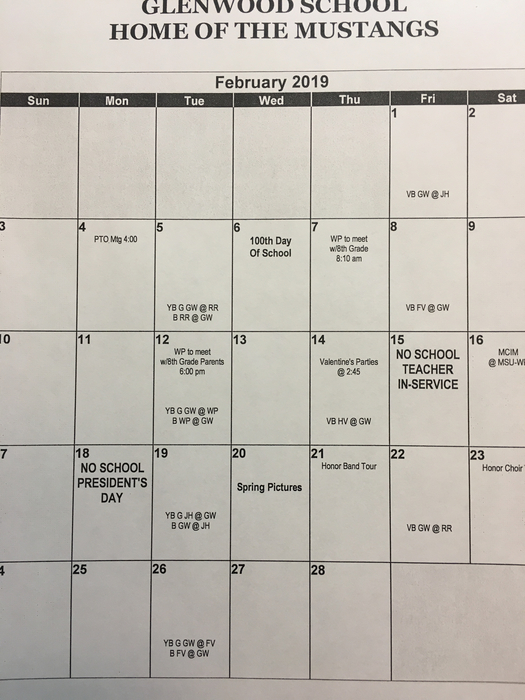 The monthly PTO meeting will be held today, Monday, April 10th at 4:00 p.m. in the Glenwood School library. The annual Title I evaluation meeting will be held immediately following. All parents are invited to attend! 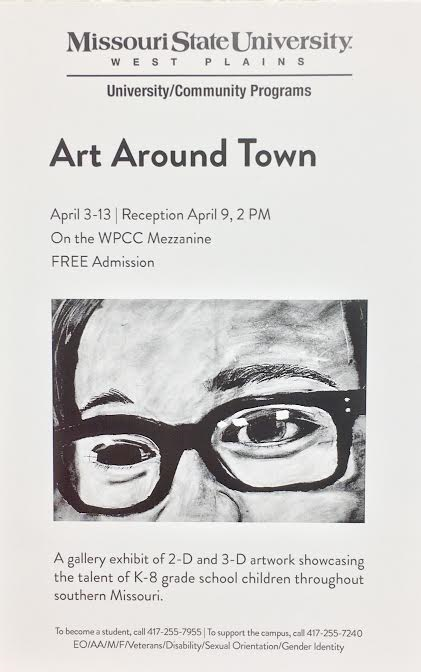 The Art Around Town Exhibit is now open! Stop by the Civic Center to check out some amazing student artwork from area schools. 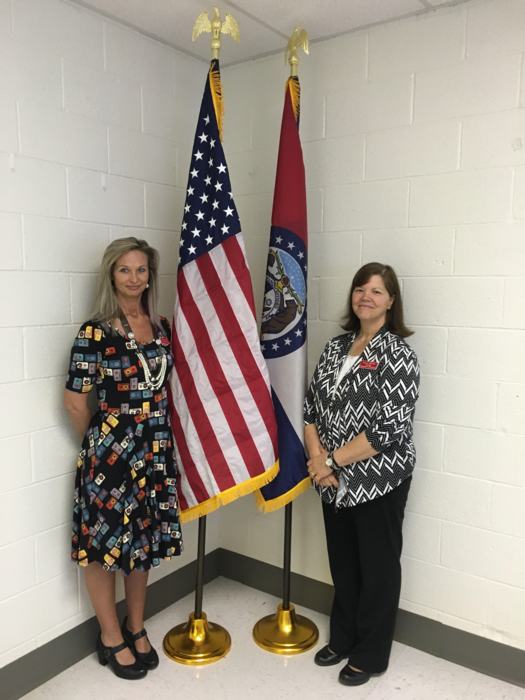 Glenwood's staff and faculty are greatly appreciative to our Parent Teacher Organization for providing us with Missouri and United States ceremonial flags which we plan to utilize in public gatherings at the school. PTO President Stephanie Cundall and Principal Karen Moffis are shown in the photo. Chess Club Reminder: Thursday, March 23rd, the Chess Club will celebrate their year with a Potluck Supper from 6-7:30 in the Glenwood cafeteria. Please bring all medals/trophies earned this year for group pictures. For those attending, please let Ms. Smith know what you will be bringing. Attention 8th graders: WPHS Cheerleading Tryouts will be held April 10-13 in the WPHS Cafeteria from 3:30 - 5:00 p.m. A parent meeting will be held Wed., April 5th at 5:30 p.m. in the WPHS Cafeteria. Parents: Due to a "glitch" in our student computer system earlier this week, some students' assignments were lost or misplaced. We would like to assure you that no student's grade will suffer as a result of this unfortunate situation. We are working diligently to ensure that it doesn't happen again. What an amazing job, Honor Band! All those hours of preparing have paid off, and you sounded unbelievable! Thanks to Mr. Miller and the GW Honor Band for all your hard work! Join us this Wed., Feb. 15th at 10:30 a.m. at Glenwood School for the annual West Plains Area Middle School Honor Band performance. 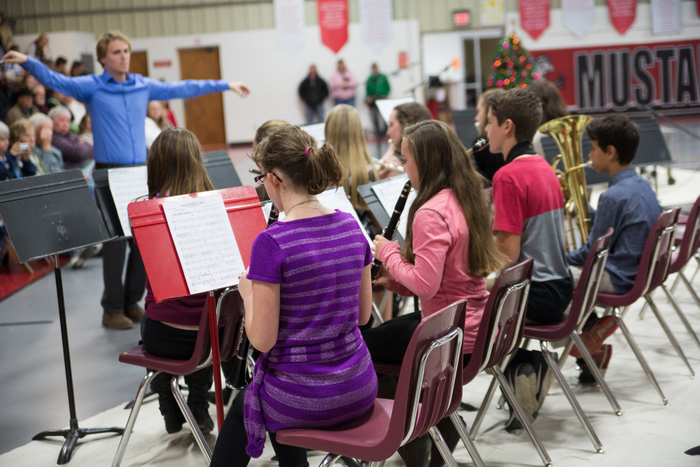 Students from the area rural schools and WPMS will perform a variety of pieces. It will be an amazing performance! Pre-School and Kindergarten Screening Dates! Call 256-4849 to schedule your visit. Pre-School - Thurs., March 16th Kindergarten - Fri., March 17th Please bring your child’s shot record, birth certificate, and proof of residency. Reminder to all A and B Team Basketball players: Please return your uniform by Thursday, Feb. 2nd. The uniforms are needed. Thank you. Tonight is Family Literacy Night! Registration and book report project viewing begin at 5:00 p.m. Classroom read-alouds start at 5:30 p.m. There will be door prizes, a scavenger hunt, hot cocoa and cookies!!! Reminder: The West Plains High School will host an 8th grade parent meeting in the Glenwood School library at 6:00 p.m. tonight. All 8th grade parents and students are invited to attend. Join us for Family Literacy Night this Thursday, Jan. 26th at 5:00 p.m.! 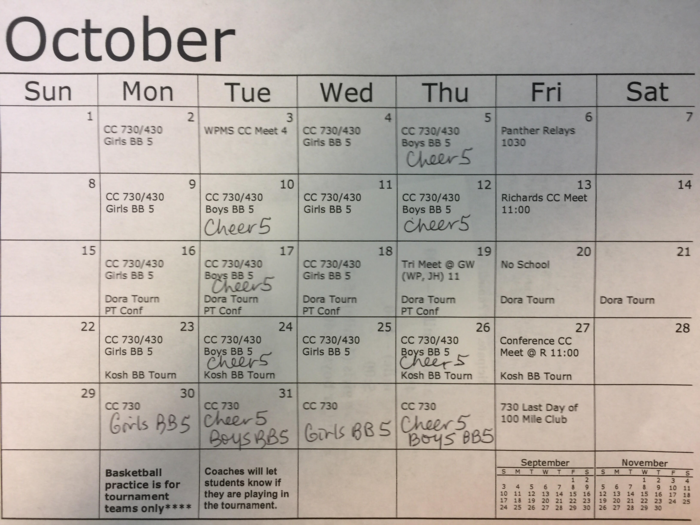 PeeWee Basketball Practice Reminder! Boys will practice Tuesday, Jan. 24th until 5:00 p.m. Girls will practice Thursday, Jan. 26th until 5:00 p.m.
Glenwood School Family Literacy Night is Thursday, Jan. 26th at 5:00 p.m. All are invited to join us for read-alouds and fun activities for all grade levels! Reminder: There will be NO SCHOOL Friday, Jan. 13th and Monday, Jan. 16th. We will see you back at school on Tuesday, Jan. 17th! Pee Wee Basketball participation forms were sent home today. 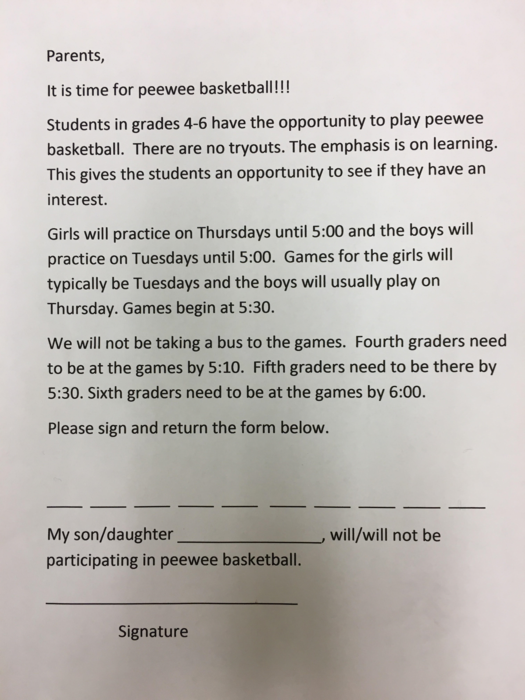 All students in grades 4-6 interested in playing PeeWee Basketball need to return the form to Coach Browning by Tuesday, January 10th. The B Team basketball tournament is next week. Girls play Monday at 5:30 p.m. at Glenwood. 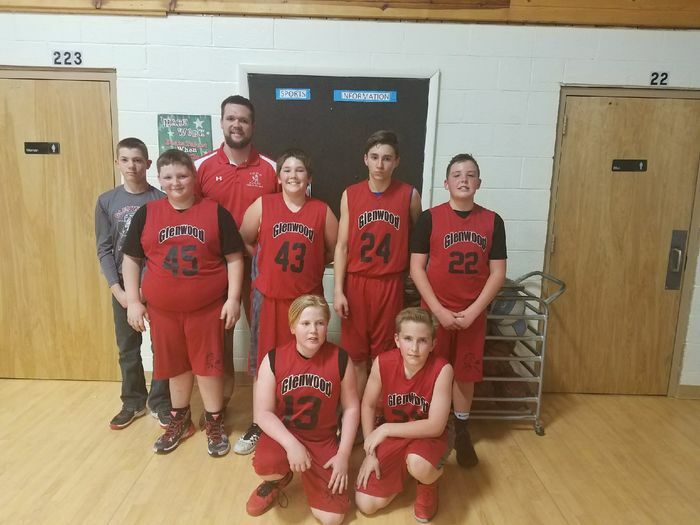 Boys play Tuesday at Junction Hill at 6:30 p.m.
Once again this year, Glenwood's PTO has raised ample funds to purchase Glenwood t-shirts for every student, faculty and staff. 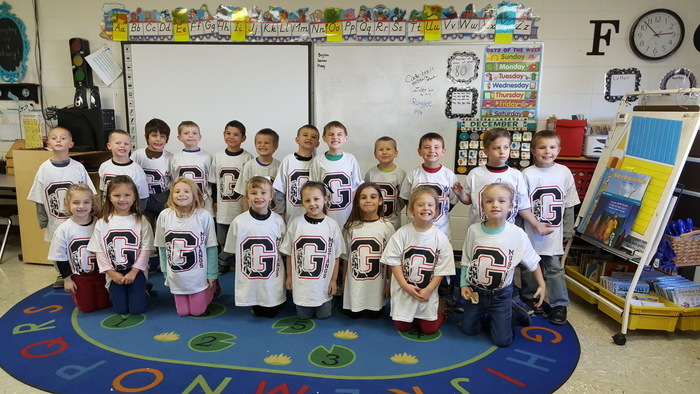 The photo shows our Kindergarten class wearing their tees with pride! A Team boys are pictured with their winning Gingerbread house. The A Team won the contest against other boys and girls basketball teams and the cheerleaders during last night's holiday team party. 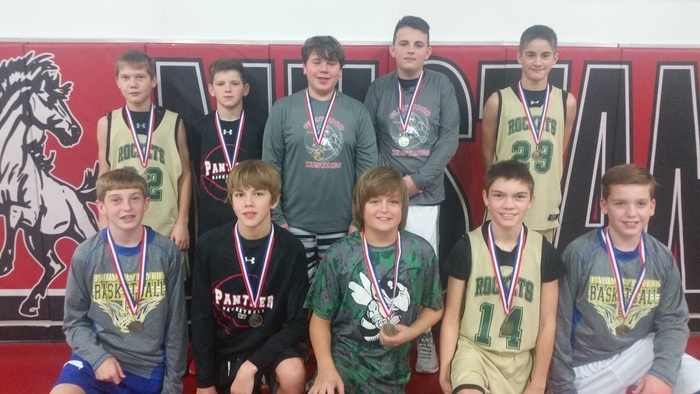 The 3-point shootout competition was held at Glenwood last Saturday, Dec. 17th. Congratulations to Maddy Kerley, 1st place; Bristol Wood, 7th place and Sebastian Rogers, 8th place. Go Mustangs! We will be running a test of our parent notification texting system this morning around 10:00 a.m. 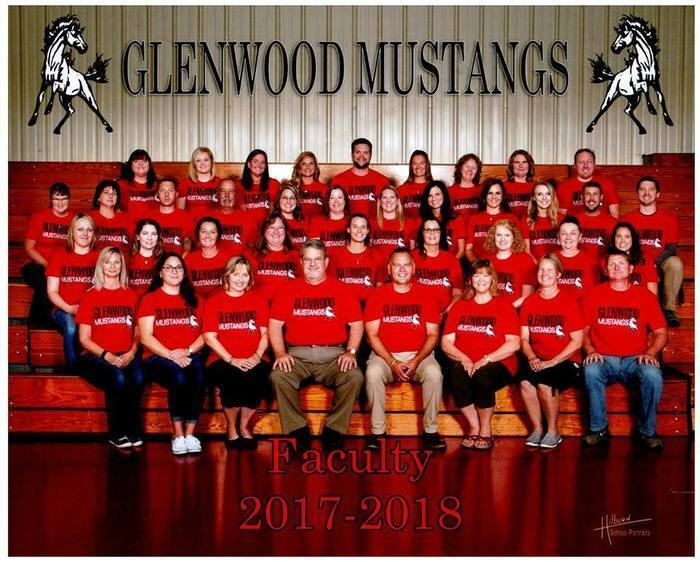 Please go to our Glenwood R-8 Mustangs Facebook page to leave us your feedback. Thanks! Pajama Day! We’re raising money to ensure that every GW student gets something for Christmas! So, wear your Jammies to school tomorrow, December 15th and bring one dollar as a donation. Even if you can’t afford to donate a dollar, give any amount you can and go ahead and wear your pajamas to school anyway! No donation is too small! It feels good to help others. Thank you for helping us make sure every student has a wonderful Christmas! Mini Mustang PHOTOS Hilburn Photography will be here Tuesday, December 20th from 3:45- 4:30 P.M. to take our group and individual photos. 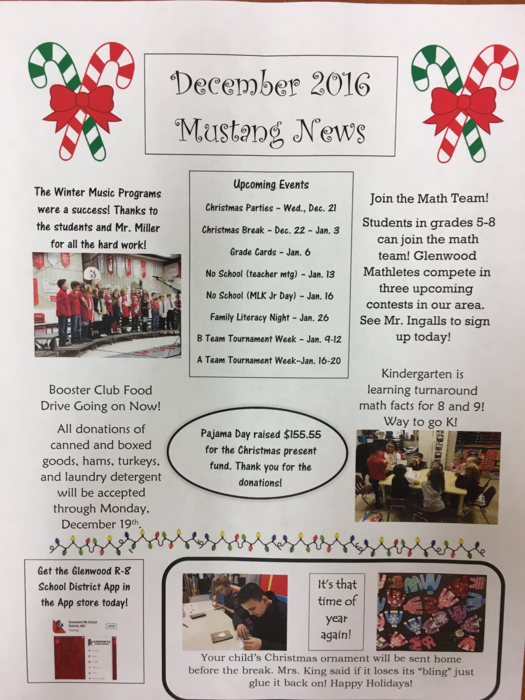 Please send Mini Mustangs with their uniforms. Pick up will be at 4:30 p.m. 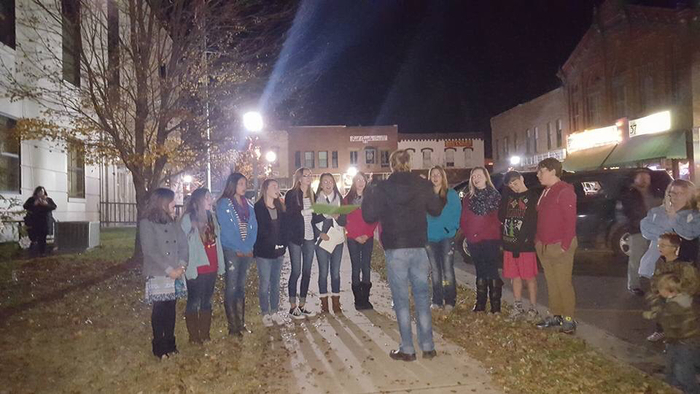 The Glenwood Choir performed at last night's tree lighting ceremony on the Square. Thank you to those students and Mr. Miller, choir director, for braving the cold and doing a terrific job! Mini Mustang Cheer Camp is after school today! Pizza and Santa hats are provided! Cheerleaders will be learning the routine for Thursday night's performance. All Minis need to be picked up at 6:15 p.m.
An important note was sent home with students today about our new school notification system. To be added to the call list, please complete and return the form by Monday, December 5th. Basketball this Thursday at Home vs JH. Games begin at 5:30. 8th grade parent recognition between A team girls and B team boys games. Last home basketball game this Thursday at 5:30. Games are against Junction Hill. 8th grade parent recognition. Order of games B Girls, A Girls, B Boys, A Boys. 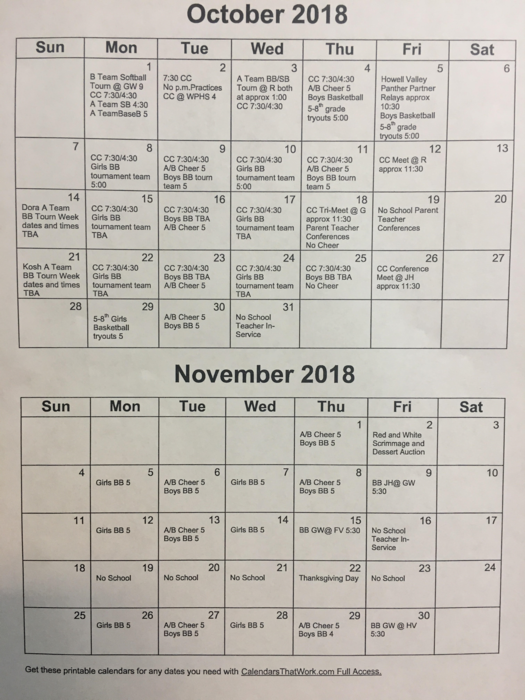 Reminder: There will be no school next week, November 21st-25th for Fall Break. Have a safe and wonderful week! Art Elective students will be traveling to the Springfield Art Museum tomorrow, Wednesday, Nov. 16th. The bus will leave at 8:05 a.m. sharp and return by 3:35 p.m.
A total of $68.91 was raised this morning. Thank you to everyone who helped or participated. Look for a fundraiser each week for the next 4 weeks! Thank you! Face Painting tomorrow morning for Veteran's Day. $1.00 per student to help raise money for Christmas presents for families in our district. Veterans' Day Activities tomorrow! Parade at 11:00 and assembly at 2:30 in the gym with a pep rally to follow. Everyone welcome! 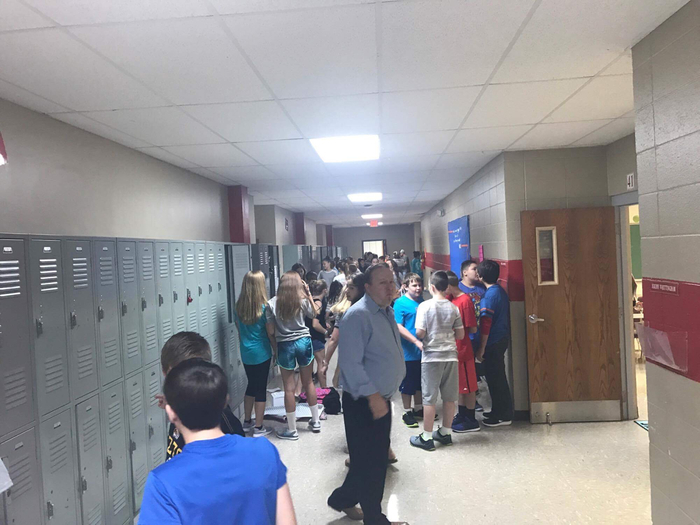 Glenwood students lined up at the polls to cast their vote! 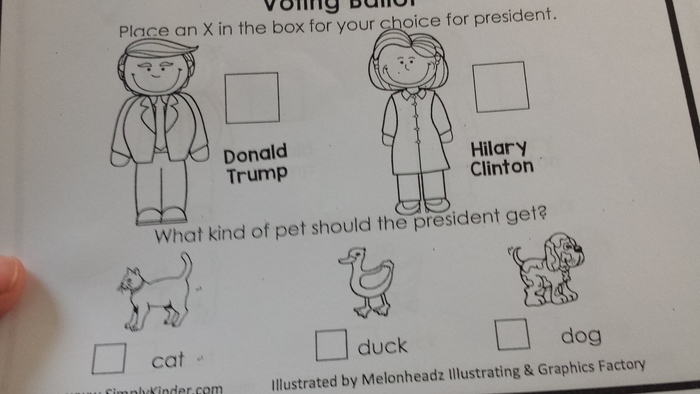 Students chose Donald Trump over Hillary Clinton with a total of 174 to 28. As for the pet the new president should get students chose dog with a total of 81 votes over duck at 41 and cat at 45..
MARK YOUR CALENDARS! The Winter Music Concerts have now been scheduled! 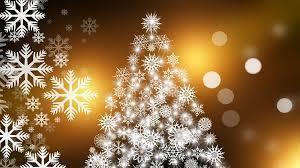 K-5 will perform at 6pm Monday, December 5, 2016 and 6-8 will perform at 6pm on Tuesday, December 13, 2016. Last chance to get your Cardinals calendar!! PTO will be taking orders for the 2017 St. Louis Cardinals Calendars through Thursday, November 10th. Contact Stephanie Cundall at 256-4849 to order yours! The November PTO meeting will be held Monday, November 7th at 4:00 p.m. in the Glenwood library. 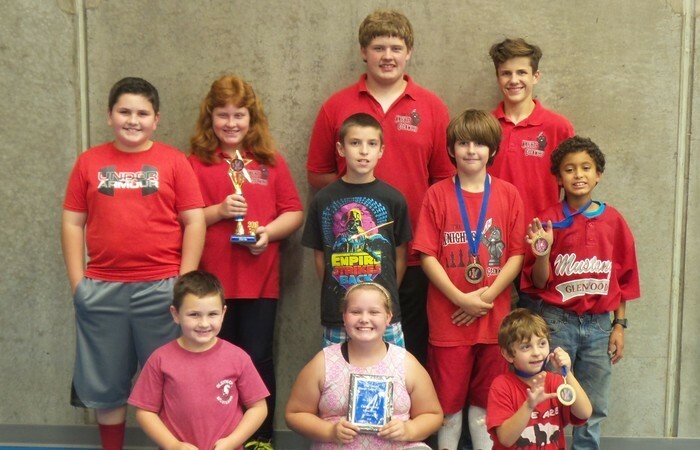 Way to go Glenwood Knights Chess Team! See our News section for the full story! 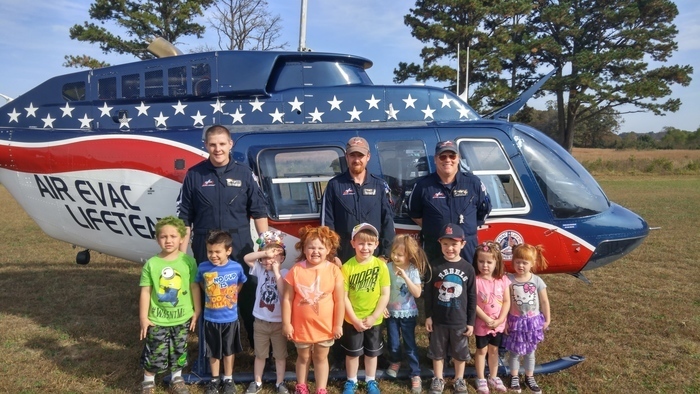 Recently, Air Evac visited our Pre-School classes. Thank you Air Evac! 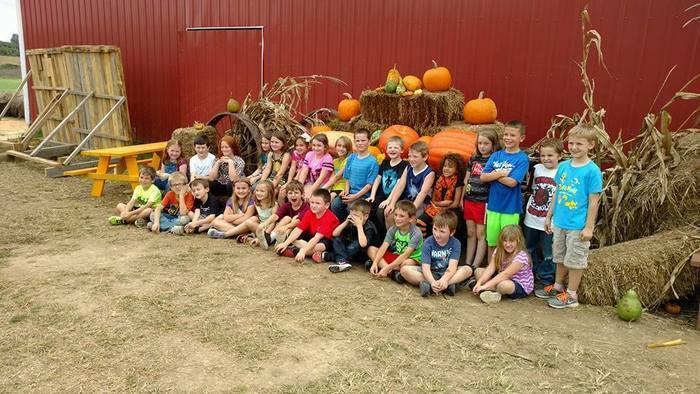 Second grade had tons of fun at the Pumpkin Patch last week! Thanks to all the parents, grandparents, and uncles that came to help! Red & White Scrimmage this Friday! 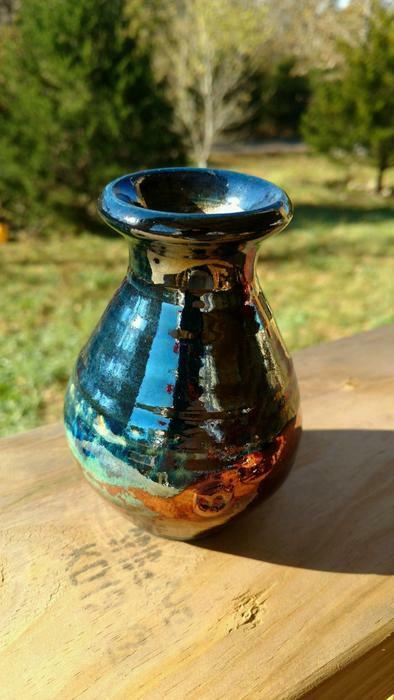 Raku Day is Wednesday, October 26th! 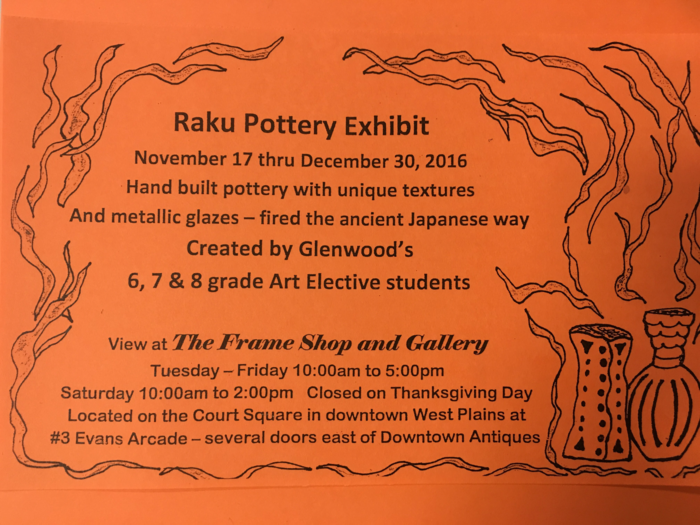 Art elective students will be firing their clay pots during their elective hour. Have fun!